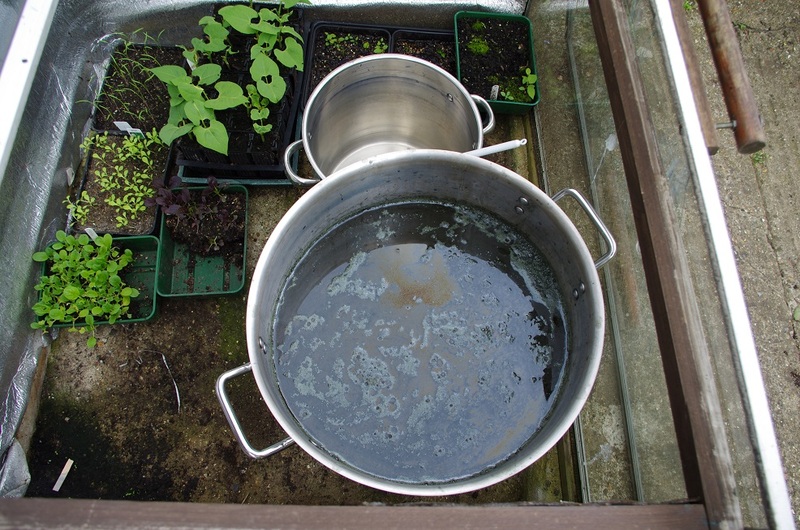 Currently the main method of indigo extraction in use on internet Facebook pages is the 2 -3 day long soak in water. I believe this was the main method used commercially in the days before synthetic indigo wiped out the western market for natural indigo. 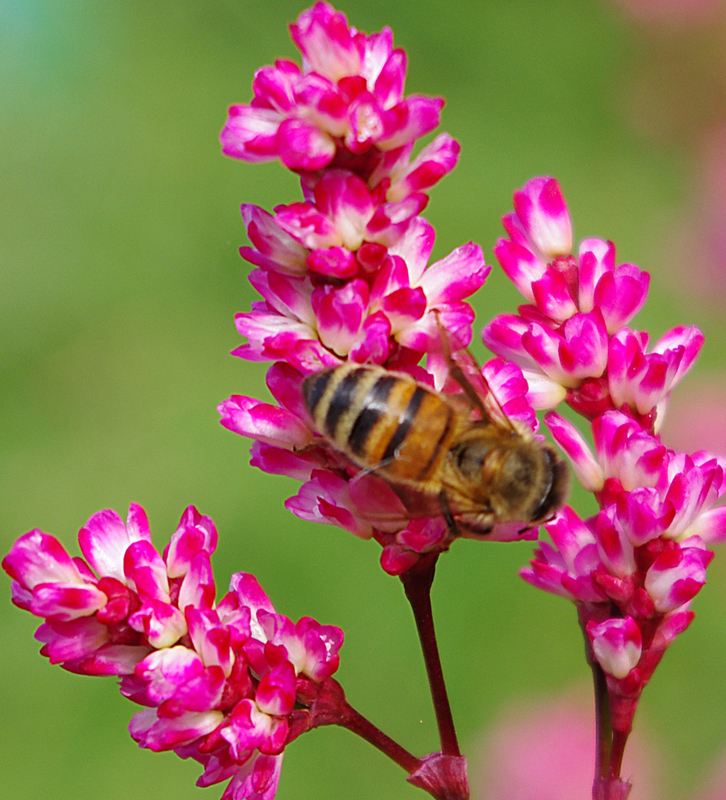 Originally used to extract indigo from Indigofera tinctoria it is still used for small scale production in South Asia. The method is now used for Japanese indigo presumably because the traditional Japanese Method of composting the leaves is too large scale and time consuming for craft dyers. So it has been with some bafflement that I’ve seen the rise of this soaking method as I have always followed the Jenny Dean method which is even quicker. We were introduced to plant dyeing through the pages of Jenny Dean’s “Wild Colour” and have used her recipe from this book for many years. It involves heating the leaves and can be done in two hours. Since we started to use this recipe we have tweaked it somewhat, discovering that there is no need to heat the leaves over 75 to 80°C to get maximum extraction. 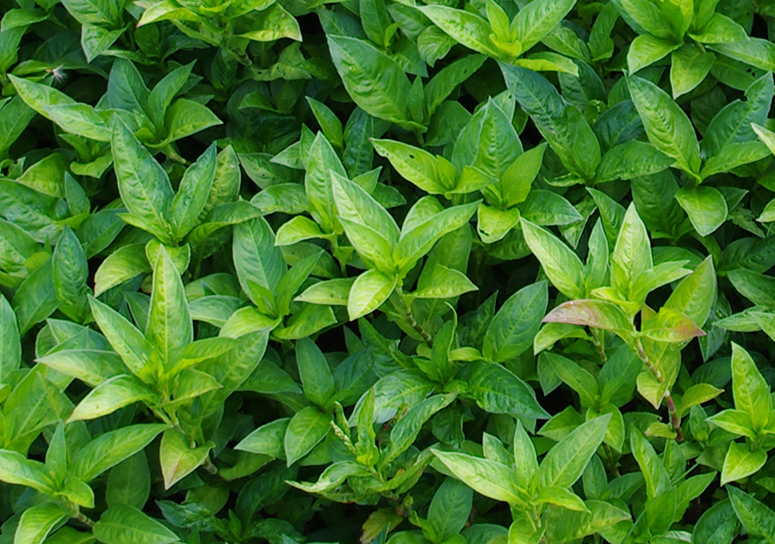 Another wrinkle is the need to allow the heated leaves to cool fairly rapidly. 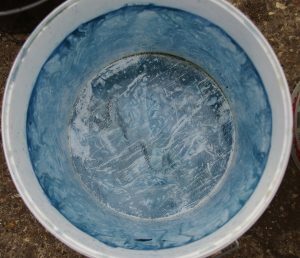 Large containers holding 20+ litres tend to cool too slowly and the indigo can be damaged. We did try one experiment when we cooled the extraction bath artificially but that was too quick and the results were very poor. 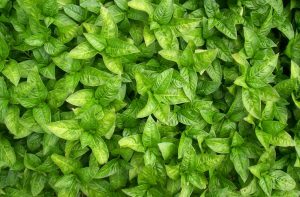 An ideal extraction would be to heat about 1kg of leaves in 5 to 10 litres of water to 75°C and allow it to cool naturally over an hour. In our climate it will fall to around 40°C or less during that time. So, now to the experiment which was a bit slap dash, but I am sure that it was systematic enough to have fairly good validity for a home dyer. I picked just over 2kg of fresh Japanese Indigo of the Long Leaf variety which was showing no signs of any flower buds. This was divided into 2 lots of 1026g. 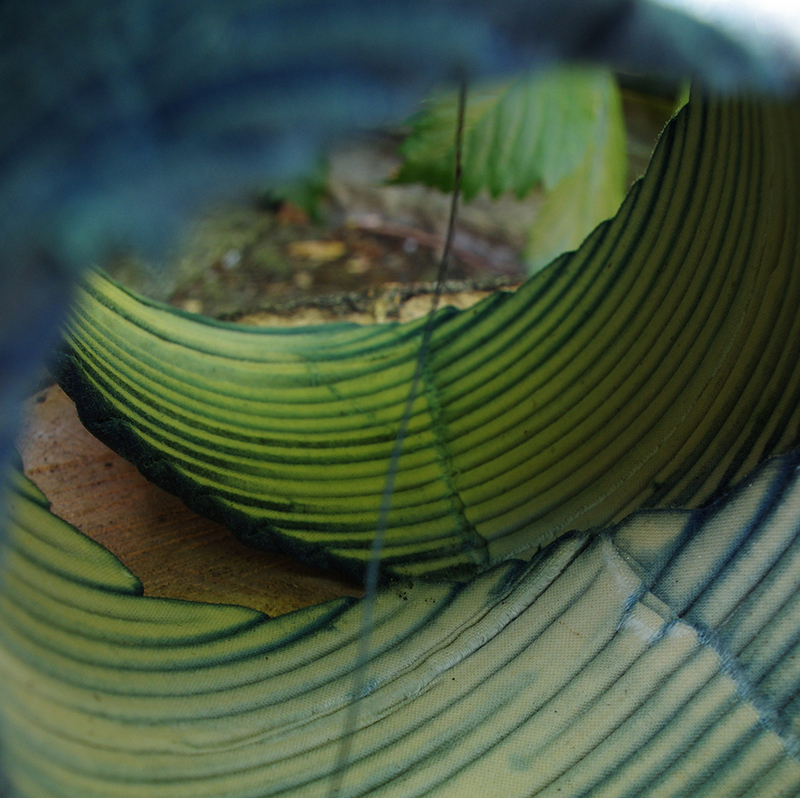 Long Leaf Japanese Indigo showing leaf curl – a result of prolonged hot sunny weather. 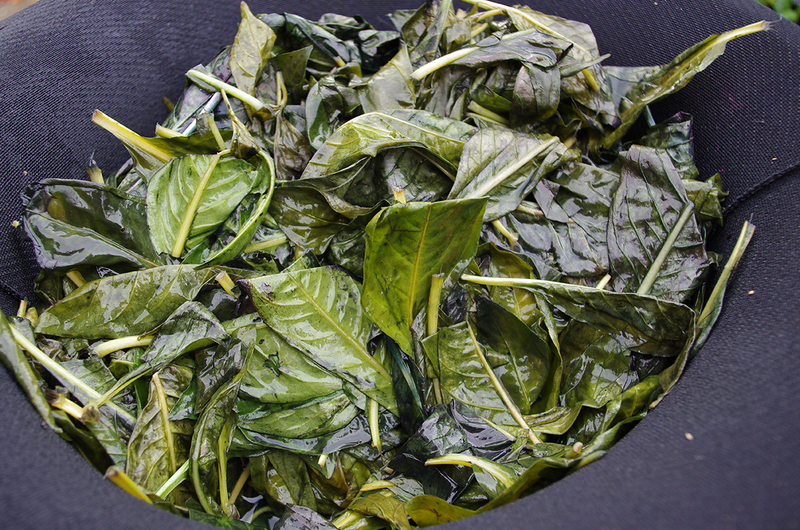 Once batch of leaves was added to a large pan with about 8 litres of cold tap water (20°C) and then gradually heated with constant stirring to 75°C. This took exactly one hour and at the end the leaves had lost all of their fresh green tint and had turned almost black. The water was a very dark grey (a lot darker than usual in fact and I attribute this to a higher than normal amount of indigo in the leaf – a result of the weeks and weeks of hot sunny weather we have had this summer). The leaves were then left to soak for one more hour, after which there was an indigo bloom at the surface and the water had darkened further. The leaves were removed (by straining through old tights) and 4 tablespoons of household ammonia were added with an immediate colour change to dark yellow/green. The liquid was then oxygenated by pouring from bucket to bucket about 20 times during which the liquid darkened to a green black. A small quantity of the liquid (viewed from above in a white plastic cup) looked olive green. 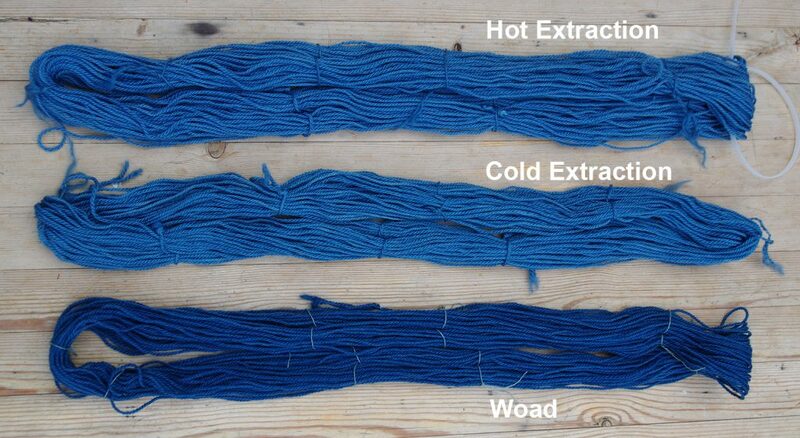 Comparison of Hot and cold indigo extraction after 1 hour of soaking but before straining. 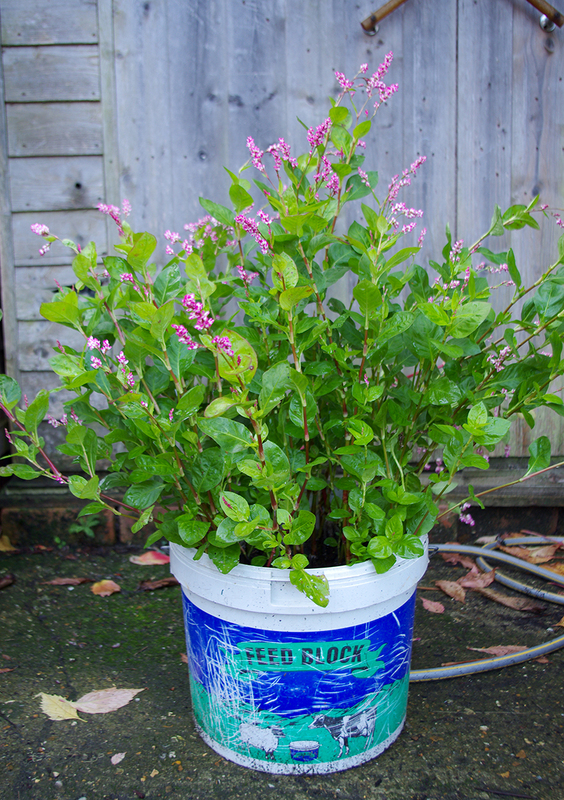 The second batch of leaves was placed in a plastic bucket filled with about 8 litres of hot tap water (57°C). I used hot water because I did not wish to wait more than 24 hours. At this temperature the leaves become slightly cooked and release cell contents into the water quicker. The bucket was then set aside for 24 hours. 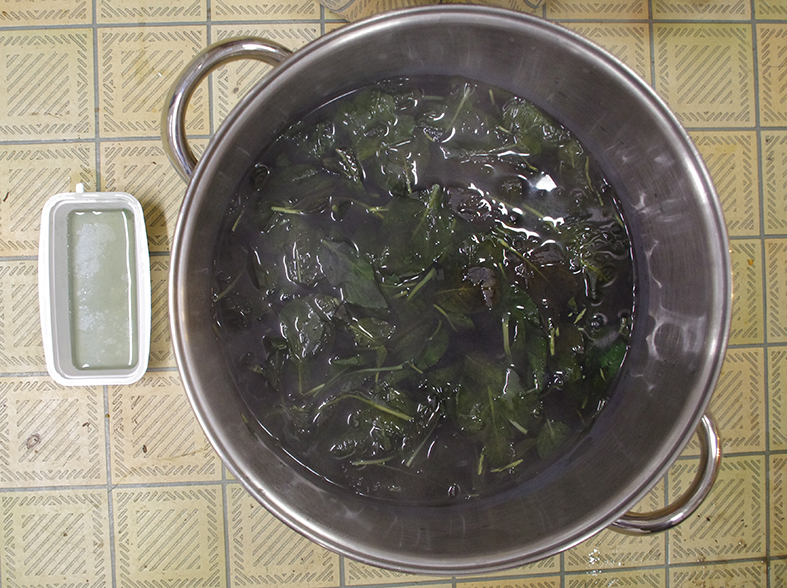 After 1 hour the temperature had fallen to 44°C, the leaves were still quite green and the liquid was much paler and bluer than the hot extraction at the same stage. See image above. After 24 hours the leaves were still greenish, although they had darkened somewhat. There was a lot of indigo scum on the top leaves. The liquid was grey with a blue tint. The plastic bucket was stained blue. Generally the results so far looked good, with much more blue visible than in the Jenny Dean method. Cold indigo extraction after 24 hours. Lots of indigo bloom on leaves. 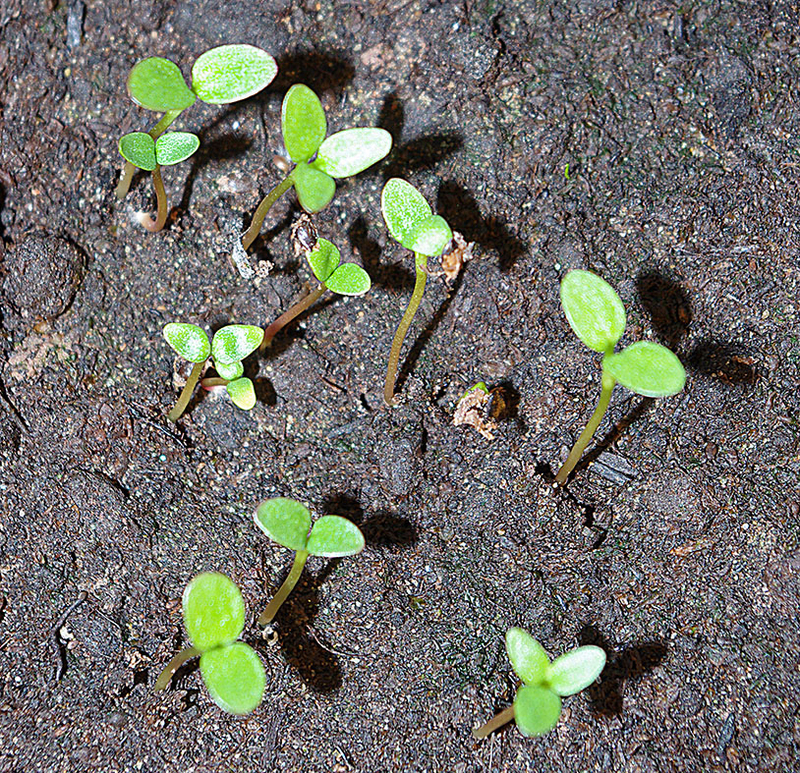 After leaves are removed, alkali (ammonia) added and liquid aerated. 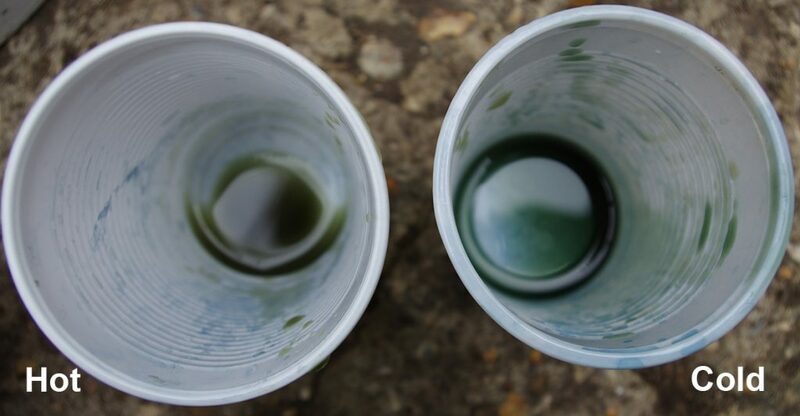 Comparison of colour of water after extraction. Colour of leaves after cold soak for 24 hours. Empty plastic bucket used for 24 hour cold soak now stained with indigo. The leaves were removed and about 4 tablespoons of household ammonia were added and the colour immediately changed to yellow green. The liquid was then oxygenated, by pouring back and forth between buckets about 20 times. During this process the liquid darkened until it was nearly black. A small quantity looked blue/green. Both extracts were then heated at the same time in separate pans to 50°C, the ideal temperature for dyeing wool, and spectralite reducing agent (thiourea dioxide, thiox) was added (one and a half teaspoons) to each pan. They were then left for about 2 hours to give ample time for the indigo to be reduced. 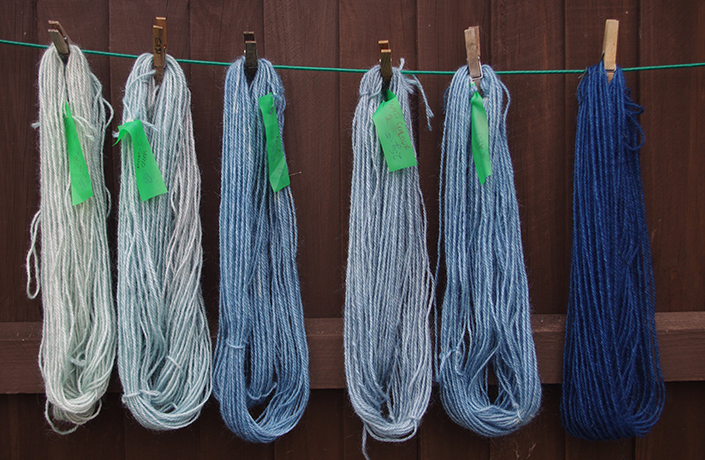 The pots were then reheated to 50°C and an identical skein of wool (Corriedale) was added to each. 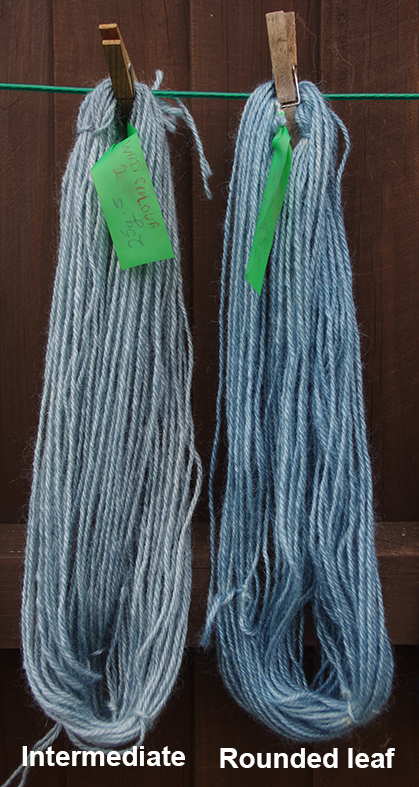 Both pots were then gently stirred to promote even dyeing and the skeins were removed after 20 minutes. Initially the colour of the skein from the Jenny Dean (hot) method looked darker but on drying no difference could be detected. Test dye showing relative strengths of dye bath from Hot and Cold extracted indigo. 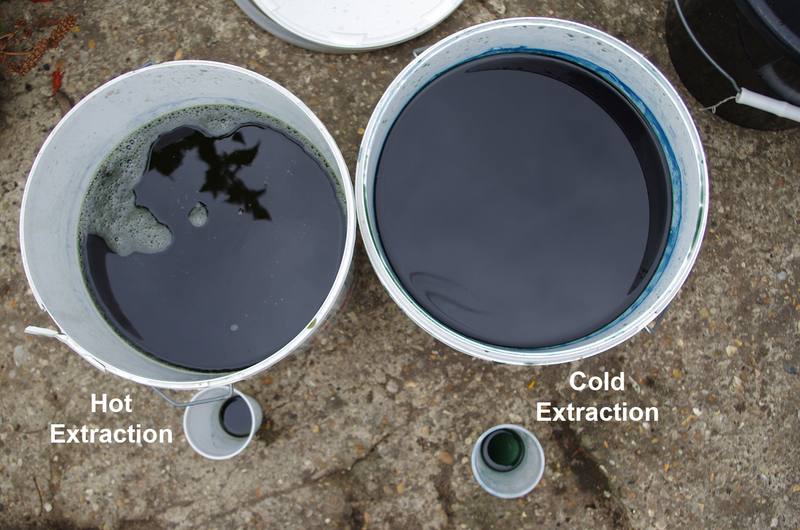 The amount of indigo extracted appears to be the same for both methods. However, heating, cooking and stirring the leaves increased the amount of fine particulate plant material in the liquid which increased the amount of sludge in the bottom of the dye bath. I should clarify I don’t use lime (as a combined alkali and flocculating agent) to obtain a dried indigo pigment from my dyeplants. 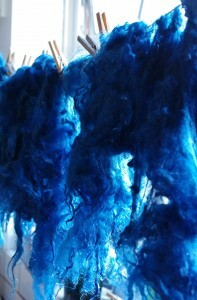 Any indigo I don’t use straightaway for dyeing, I store as liquid sludges. But I can see that for people who do use lime, the cold soak is advantageous because the resulting indigo pigment would contain fewer impurities than the hot soak because the liquid extract after straining is purer. For myself I’m quite happy to continue using my modified Jenny Dean process as it is fast and reliable. 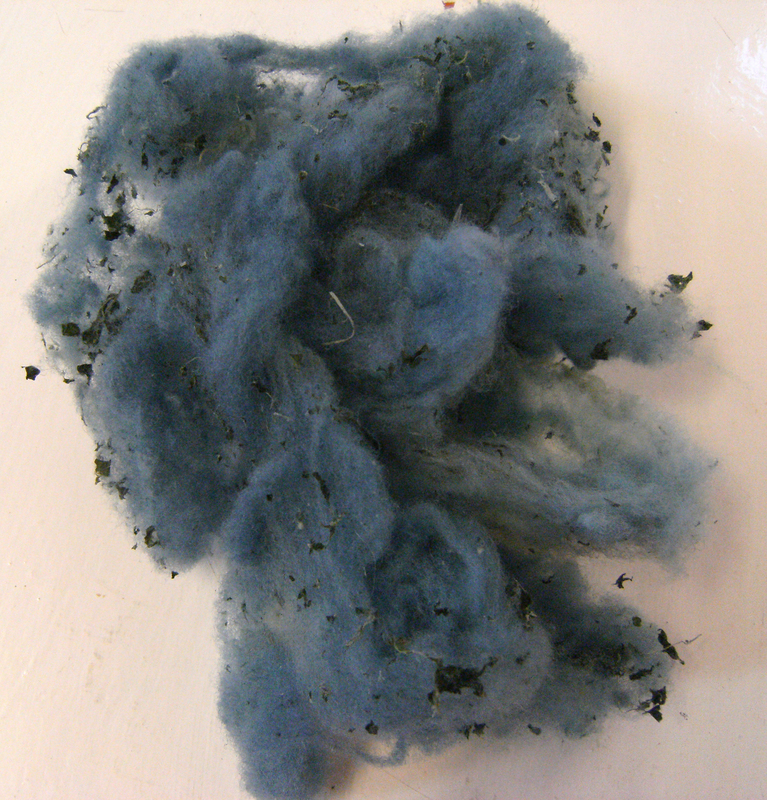 Out of interest I also decided to compare the Long Leaf Japanese Indigo to Woad. 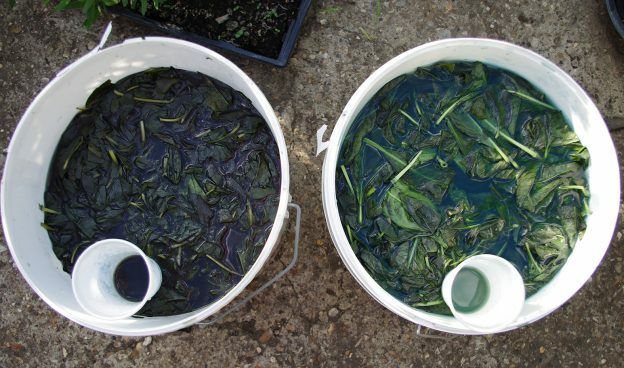 I processed a similar quantity of Woad leaf according to the 24 hour soak method in the experiment. 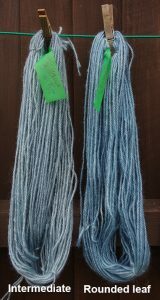 Another wool skein was dyed in nearly identical conditions and the results prove to me that Woad can actually produce more indigo than Long Leaf Japanese Indigo. Comparison of strength of indigo extracted from Long Leaf Japanese Indigo and Woad. There has been a lot of controversy about which alkalis produce the best results. I have tried most of them and found that what is important is the pH not the exact chemical used to get there. Washing soda is the weakest and produces very poor results. Household ammonia is excellent and relatively safe, provided you don’t get it on your skin or breathe it in. Calcium hydroxide (lime) is good and has the added benefit of soaking up the indigo precipitate and settling it to the bottom fast (flocculation). Sodium hydroxide is also good but is very corrosive – a danger to skin and textile. Whenever using strong alkalis you must take safety precautions: wear gloves; avoid splashes; don’t ever add water to dry alkaline powders or granules, add the powder to water; label colourless solutions and store safely; never leave sodium hydroxide solutions unattended for curious animals or children to explore (it is colourless and odourless and very corrosive indeed). 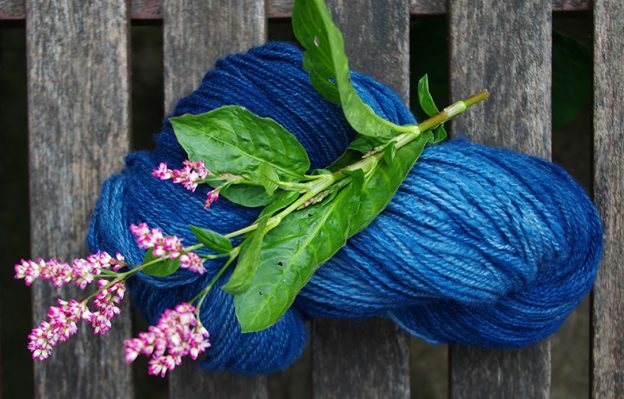 This entry was posted in Ashley's posts, Experiments, Grand teint, Indigo Extraction, japanese indigo, learning to use dye plants, woad and tagged Indigo, Indigo dye, Indigo dyeing, Indigo Extraction, Isatis tinctoria, Japanese Indigo, Natural dyeing, Persicaria tinctoria, Polygonum tinctoria, Woad on 16th August 2018 by susan dye. On the 9th August, after two months with barely a drop of rain, the heatwave and drought in the South East of England may finally have come to an end. Despite regular watering the unnatural weather has taking its toll on our dye plants. 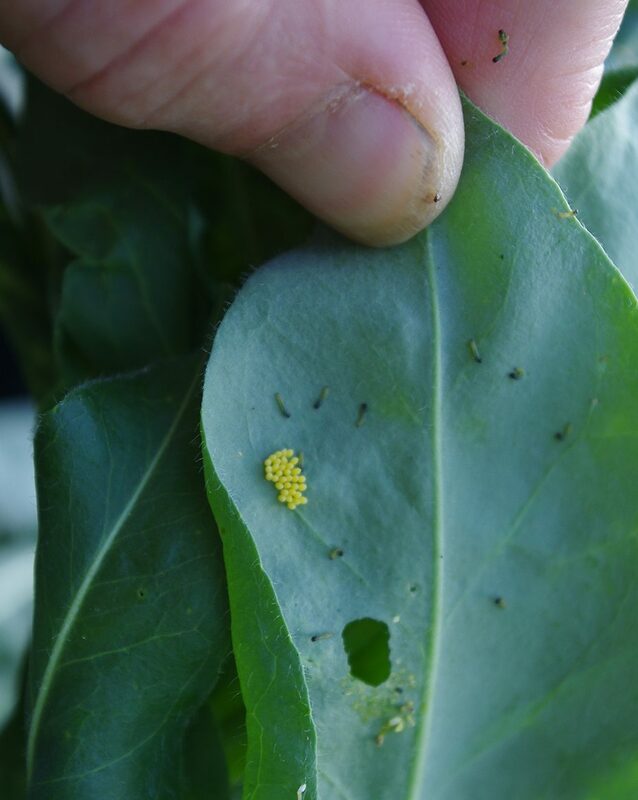 For the first time our woad plants are being eaten by Cabbage White butterfly caterpillars (Large White Pieris brassicae and Small White Pieris rapae) and more recently by flea beetles (genus Phyllotreta). I guess the critters were getting desperate to find plants with a bit of juice in their leaves. 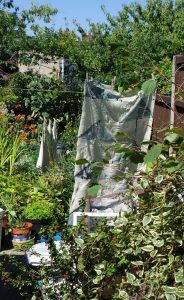 The weather is having an impact on me as well, I have to water the indigo nearly every day and keeping the rest of the garden needs water too so I’m spending hours each week that I’d rather be spending on writing or dyeing. 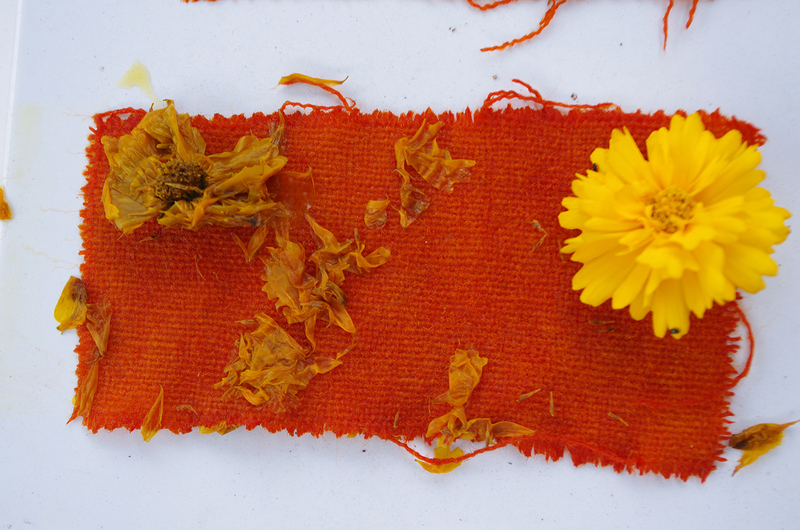 This is the first part of a two part post on observations of the dye plants in our garden. This one deals with the plants we have been growing for more than a year. 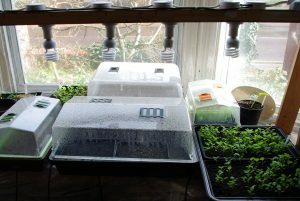 The second part will cover new plants. 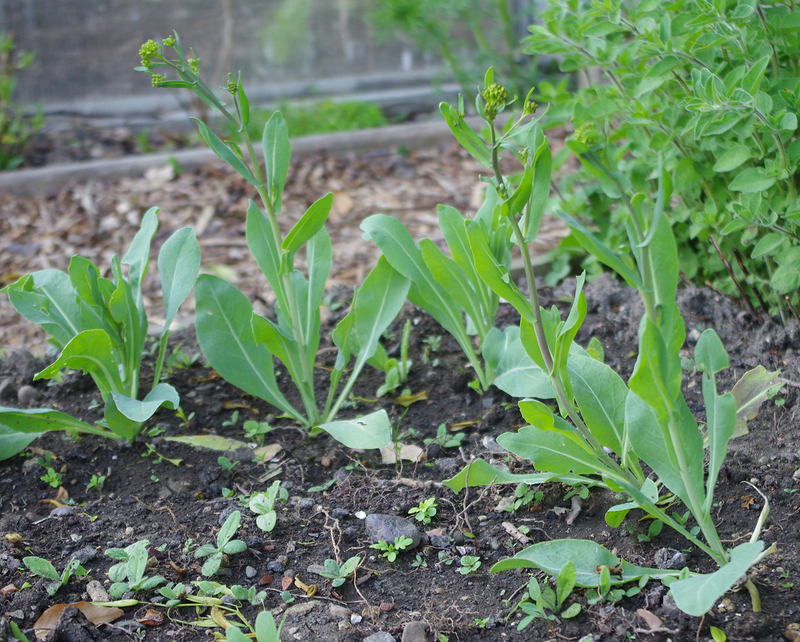 These Large White caterpillars managed to eat the whole woad leaf, leaving only the midrib behind. 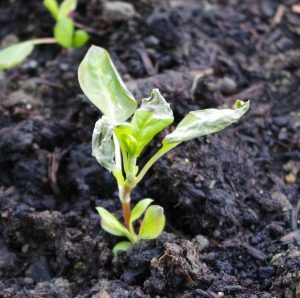 We have grown Woad for about 12 years now and for the first time our plants have been attacked by caterpillars and flea beetles. This makes a change from the usual small black slugs which put a few holes in the leaves but seldom do any serious damage. 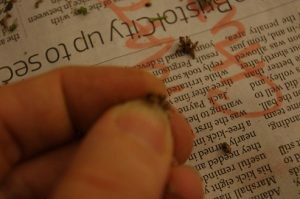 Shiny black small Flea Beatles can slowly chew their way through a woad leaf leaving it like a sieve. 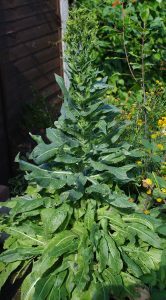 Woad flower spike August 2018 – from seed to flower in one season as a result of pampering. I expect that the extraordinary hot weather is to blame with the butterflies and beetles probably acting in desperation. 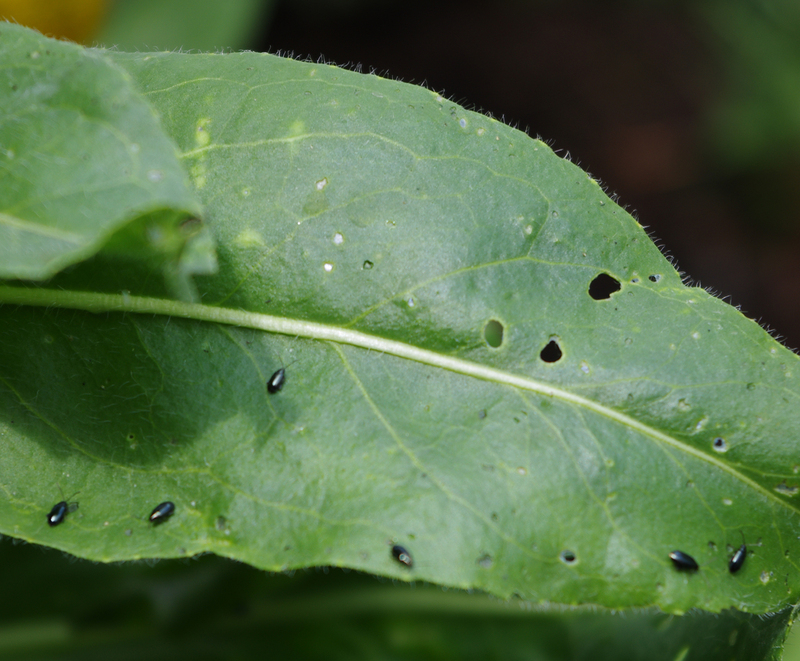 Although the flea beetles appear to thrive, the caterpillars have had a much harder time digesting the unpalatable leaves and most of the newly hatched critters have simply died, leaving a few small holes in the leaf. Only one plant had its leaves reduced to its midrib but even this one will survive as it is now putting out new growth. Interestingly it appears to be only the plants I have watered which are being eaten. There are a few plants which never get watered and these are looking fine. 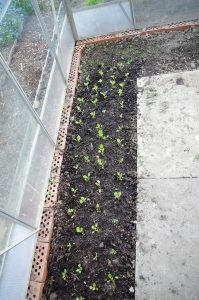 A few people have asked about growing Woad in tubs or containers and this year we’ve had a few in containers ourselves and this has revealed a problem. One of our plants grown in a container in good compost and watered and fed regularly has grown large and is currently putting out a flower spike which will drastically reduce the amount of indigo in its leaves. Its very unusual to see Woad flowering in August so I can only assume we have pampered it too much – given it the ability to grow large enough to flower in one season. 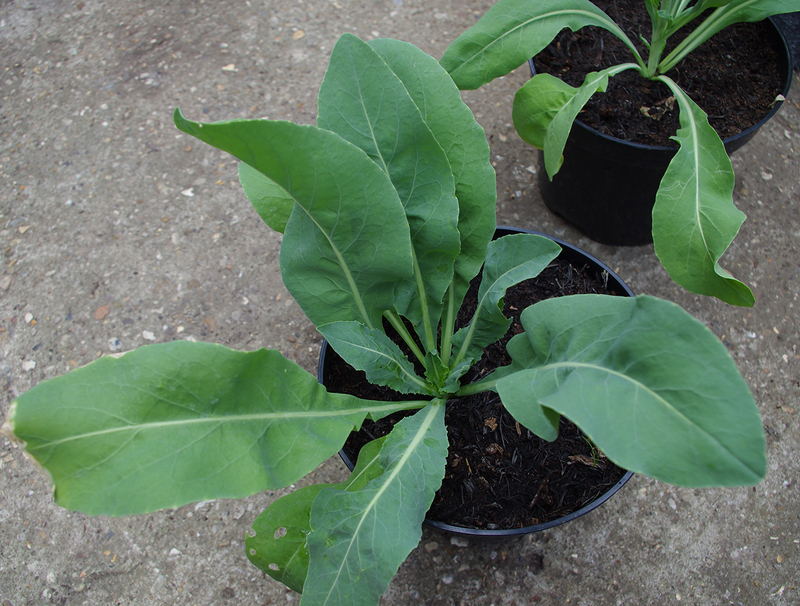 So if you are growing Woad in containers don’t give them too much fuss! We have been growing this for two years now, desperately trying to find out how to stop it flowering a few months after planting. From what I’ve read I’m in good company and this is the chief reason Chinese Woad has not caught on as a source of indigo, despite the fact that it could potentially produce as much dye as Japanese Indigo. Some of the literature indicates that botanists think Isatis indigotica is basically just a variety of tinctoria (European Woad). However, if that is so it has evolved away from tinctoria to a considerable extent. Indigotica is clearly adapted to a much warmer climate and although still nominally a biennial it behaves much more like a half hardy annual. 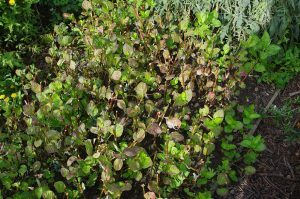 It will flower at any time of year, even in winter, so its rosette stage is always very short and the plant never gets very big. 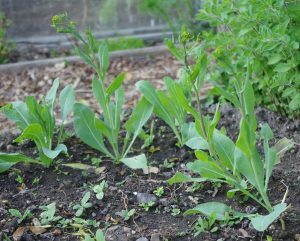 The leaves are a paler blue-green than European Woad and its yellow flowers will continue to be produced throughout the year provided the plants are watered and taken care of. 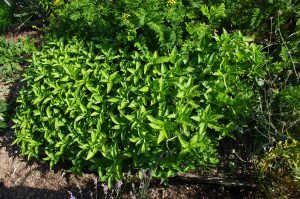 Once the plant starts to flower the larger rosette leaves die off leaving only small leaves on the plant which are probably no good for dyeing. 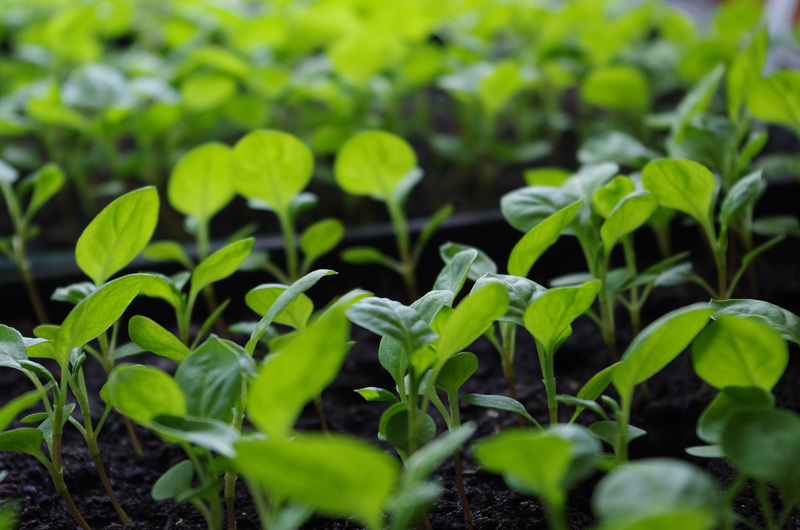 According to the Handbook of Natural Colorants, indigotica will be triggered into flowering if the night time temperature falls below 5°C, which makes it almost impossible to grow the plant to any respectable size here in the UK. Even in Mediterranean climates the plant can only usefully be grown in the Summer. From my experience the plant will flower even if you just look at it the wrong way so I’m coming to the conclusion that it’s not worth the effort. 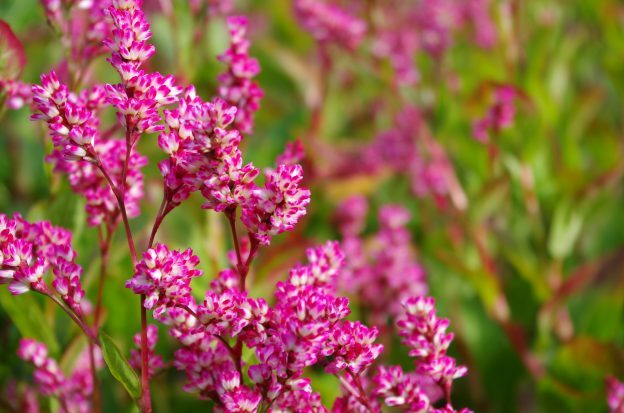 It does grow very quickly however and if you were to grow it en masse and harvest the leaves before it flowered it might just provide a return for your efforts. Another problem with Chinese Woad is its susceptibility to pests. 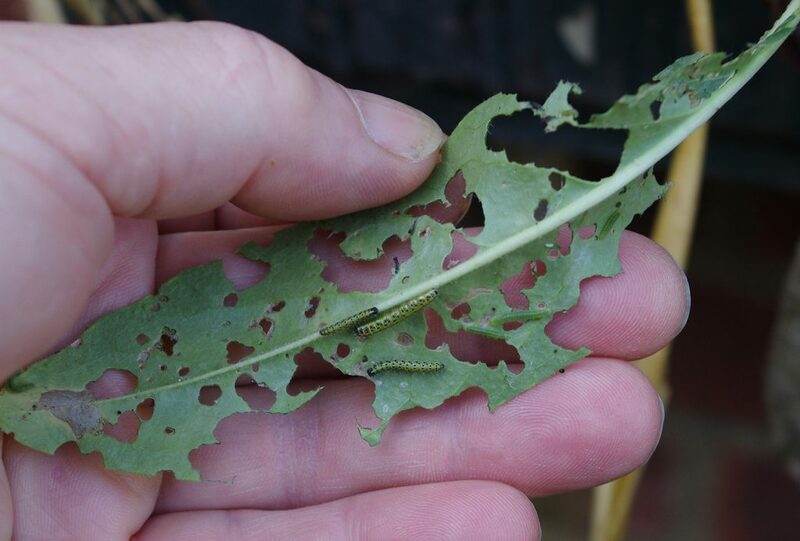 Caterpillars and aphids like it very much and can easily destroy your plants. And you guessed it, significant insect damage will also trigger flowering. In a mad moment I decided to see if Chinese Woad tasted any nicer than European Woad. But the taste test settled nothing, both plants are extremely bitter and fiery. I obviously don’t have the finer tastes of Cabbage White butterfly caterpillars! 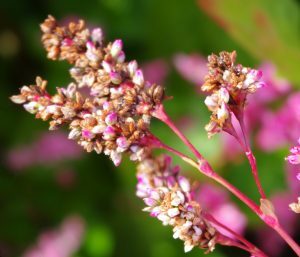 This year we are growing the same three varieties as last year – Long Leaved, Broad Leaved and an Intermediate Leaved white flowered variety. There appears to have been no interbreeding from last year. 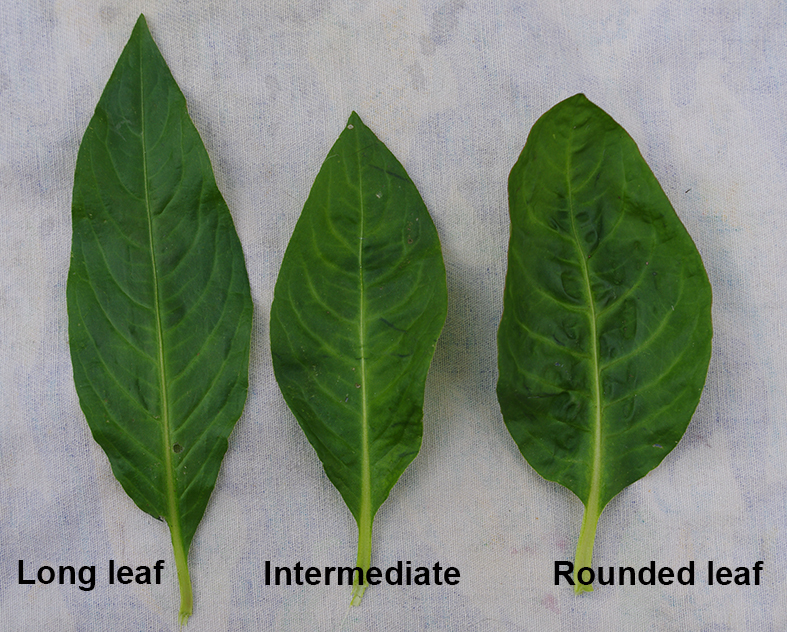 This year the difference between the long leaf and broad leaf varieties is stark. 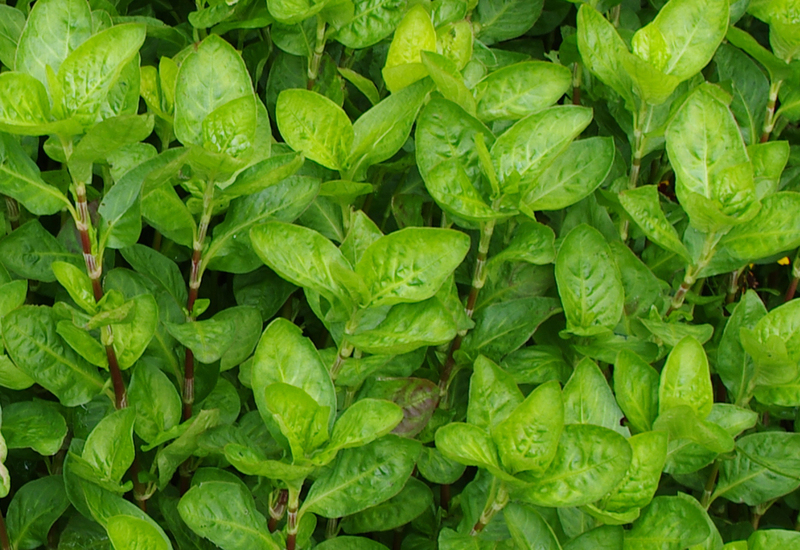 The Long Leaf plant is very vigorous with dark green leaves. The Broad Leaf variety took a long time to get going as usual and suffered from its leaves turning red. 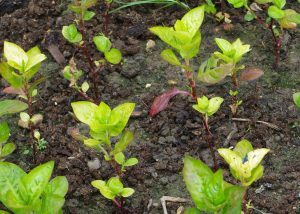 I was initially confident that the red colour was partly due to the hot sunny weather we were having in early summer – the slow growing plants were getting roasted. But after a good feed (with chicken manure pellets) the plants started growing quickly with the new foliage a nice mid green despite the continued hot sunny weather. 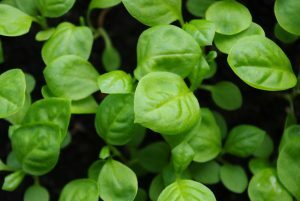 So a bit of a chicken and egg situation: was it the lack of fertilizer that caused the leaves to redden or simply that the young plant leaves, growing slowly, were getting a longer exposure to the hot sun? The Long Leaf variety reacted differently to the hot sun with leaf curling , something I had seen last year but only on plants grown in the greenhouse. A bed of intermediate White flowering Japanese Indigo. 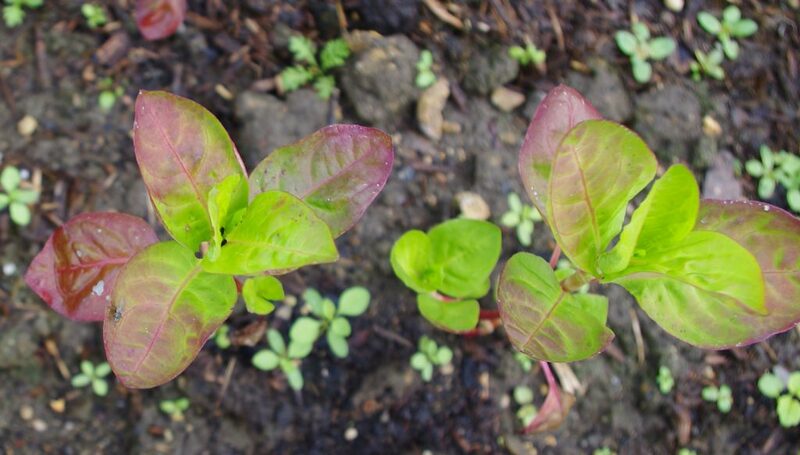 Newly planted out Broad Leaf Japanese Indigo with sun reddened leaves. Thus far we have only harvested the Long Leaf variety and used it in a little experiment comparing Jenny Dean’s extraction technique with the more often used long soak in cool water. The results will be written up in a later post. 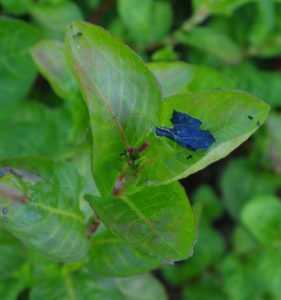 What I have also noticed is that we are currently getting a considerably better production of indigo from Woad than the Long Leaf variety of Japanese Indigo. 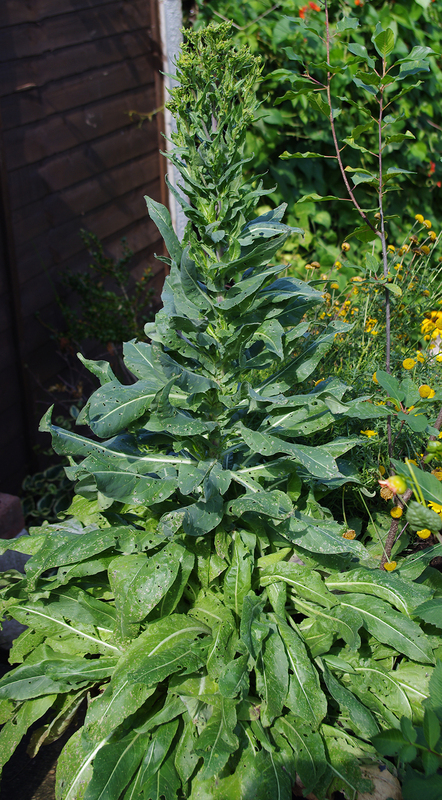 Woad is well known for giving better results when the weather is hot and sunny. 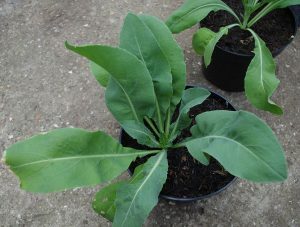 If the climate change predictions are correct and we continue to have hot summer weather then I think we would be better to return to growing mostly Woad. The Long Leaf variety of Japanese Indigo produces the least amount of indigo dye of the three varieties (see comparison here) but it does produce larger plants so perhaps still produces an equivalent amount of indigo per square metre. 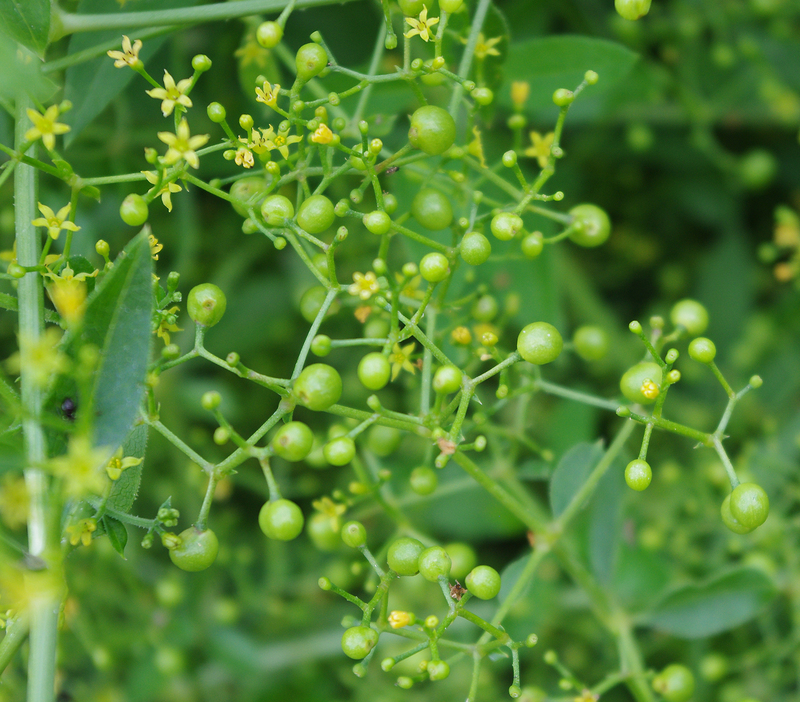 Once again this year the madder plants are producing masses of berries. This is the third year running. In the previous 10 years or so the plants produced only a few. I have no explanation as to why this is. I’ve grown plants in different soil, in planters and in the ground and all plants are doing the same. A result of the weather? 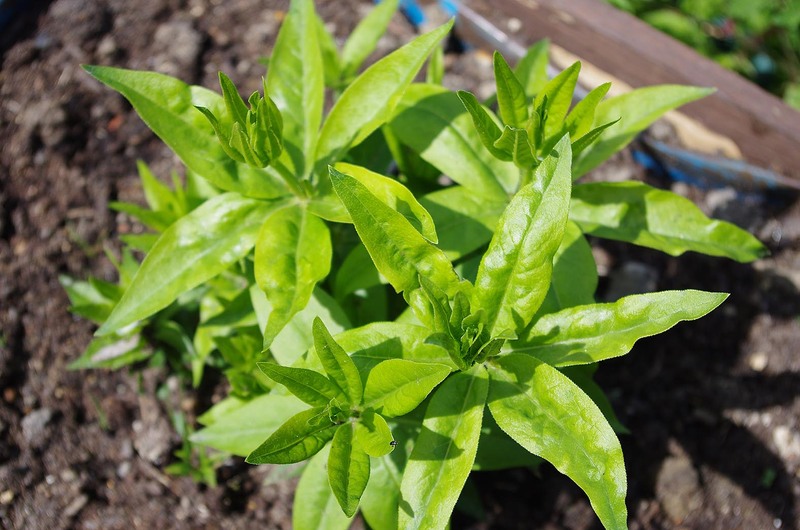 Madder plant obtained from Southwark Cathedral in early 2018. 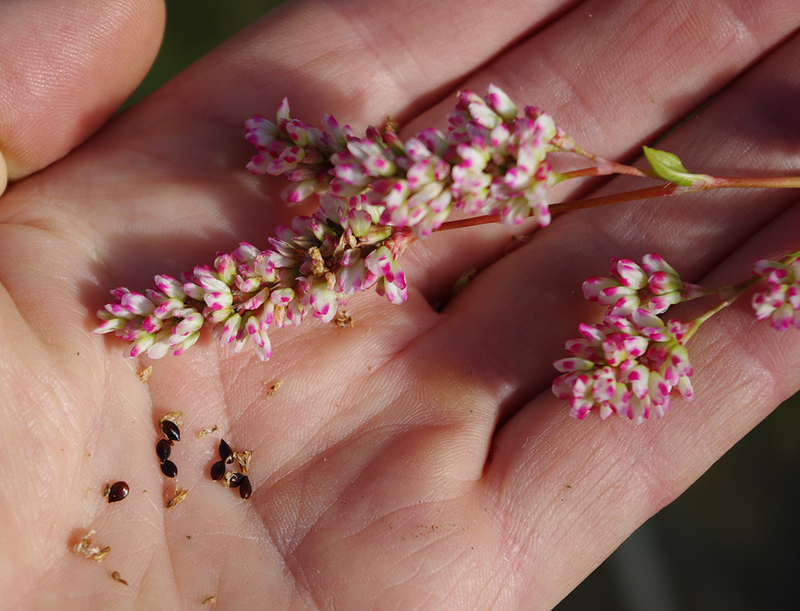 This year we obtained a new madder plant sourced from Southwark Cathedral dye garden. The plant is quite different to plants I have been growing up to now (all of which were derived from a single seed over 10 years ago). This new plant has paler leaves with a different shape and it flowers about 3-4 weeks later. It will be interesting to see if the root yield is also different. 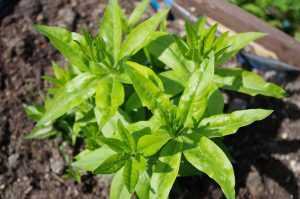 I’m pleased to have been able to increase the genetic diversity of our madder as I’ve always propagated by root stem cuttings or from seeds from my own plants. We’ve been growing this plant for nearly three years now. It’s an evergreen but the tops do not appear to be totally hardy in the UK climate and were damaged by the winter frosts. This is the first year in which the plants (originally obtained from a wild flower nursery) are starting to look a bit happier. 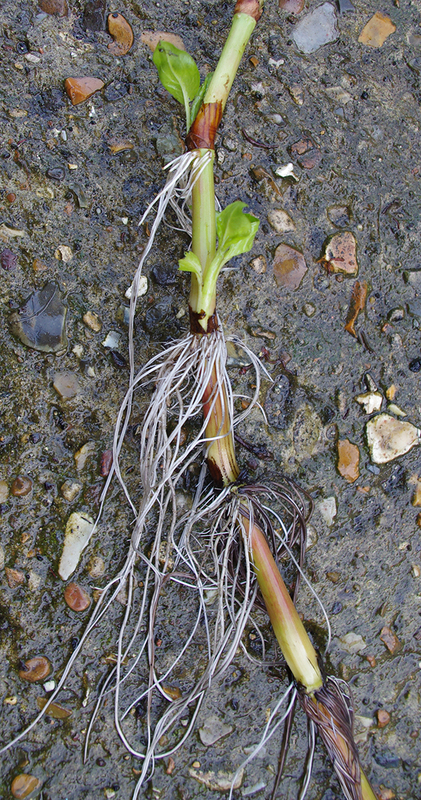 They are putting out new shoots from underground stems and flowering for the first time. 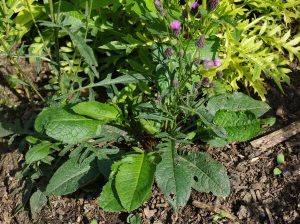 It remains however a very slow growing perennial and I think it will take longer than Common Madder to produce a good root harvest so we are leaving it for another year. 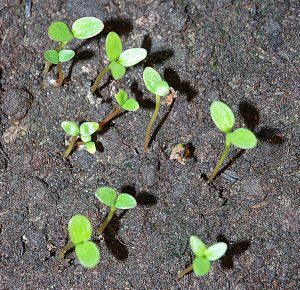 I was given some seed from a friend from some wild plants growing on the south west coast which nearly all germinated though it did take well over a month before the first shoots appeared. 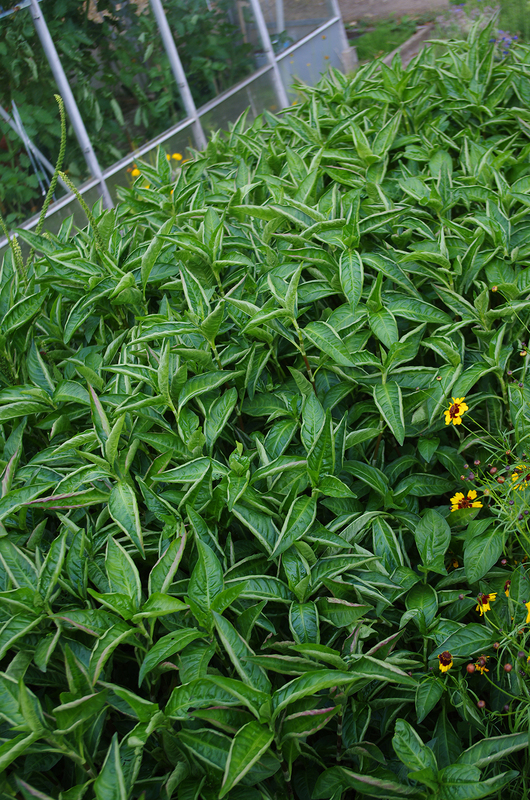 Saw-Wort plants with yellowing of leaves. 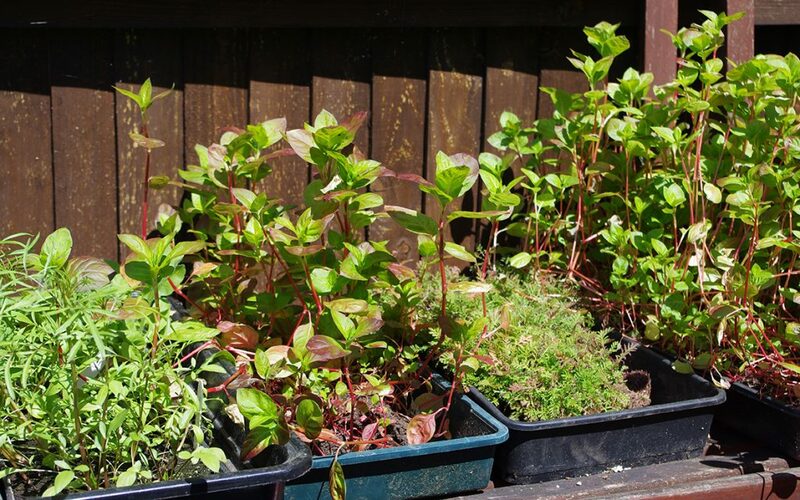 A self seeded plant with dark green leaves growing next to the transplanted ones with yellow leaves. This native plant continues to be disappointing. 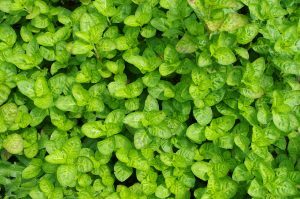 Not only do the plants remain small but about half of them suffer from bad yellowing of the leaves once planted out in the garden. 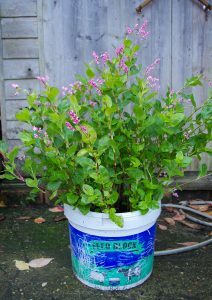 I have tried practically everything to remedy the problem – fertiliser, Epsom salts and seaweed extract. 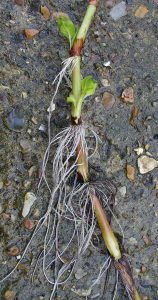 There are some self-seeded plants which look very healthy so I do wonder if the roots are somehow getting seriously damaged during transplanting. 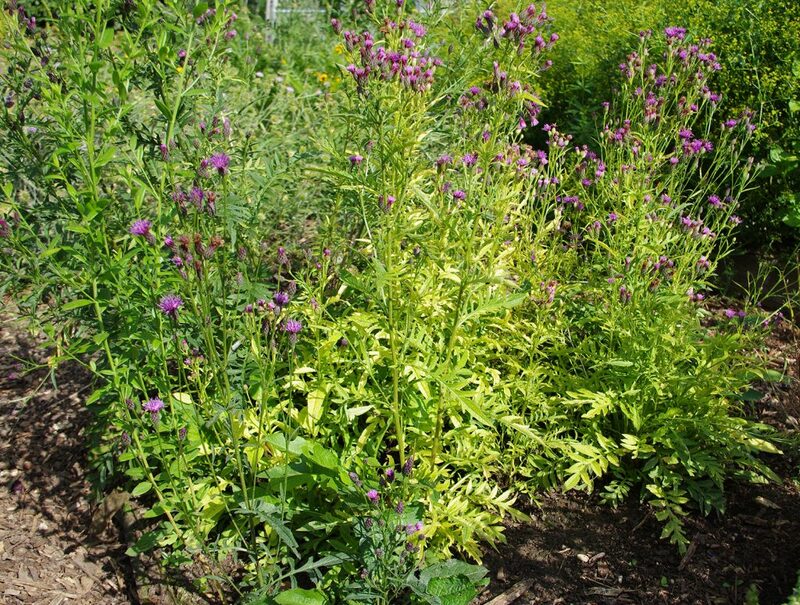 It also remains likely that there is something wrong with the soil itself as other plants (Genista, a red scabious and a Purging Buckthorn shrub) are similarly affected. 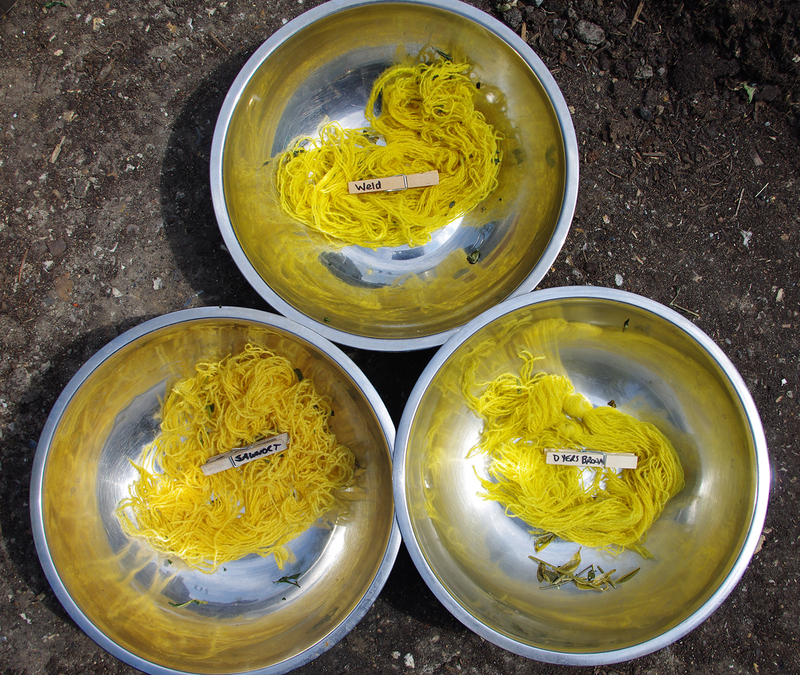 We did try dyeing with the Saw Wort this year and obtained a good buttery yellow. We were hoping it would be a nice lemon yellow like Weld and Genista so were a bit disappointed with that too. 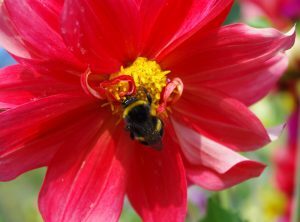 Bumble bee on single type dahlia grown from seed. 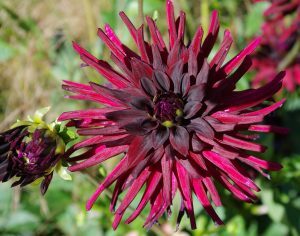 The colour of Dahlia flowers has an effect on its dye but we did not appreciate by just how much until this year when we tried using some deep red flowers to dye with. We obtained nothing like our accustomed strong yellows with acid pH and strong orange with alkaline pH. This time we got green with alkali and blue/purple with acid indicating that the dyes in this dark red flower were the same as you find in red cabbage and some other red flowers. These dyes, although very pretty, are not light fast. Over the years of growing Dahlia we have narrowed down the varieties that produce the best results for the home dyer. These are yellow or orange double flowering pom pom types. 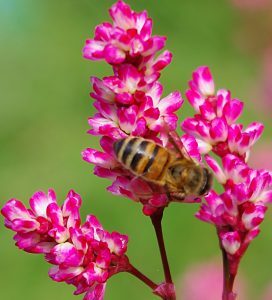 The pom pom flowers are longer lasting and produce more dye – some pom poms are very large and yield a lot of dye but bees and pollinators are unable to assess the nectaries. We have tried to stay away from these but there’s no doubt they are the best for dyers. Tansy needs regular watering for healthy plants. Often used by Scottish dyers as a source of yellow dye this plant has been growing in our garden for several years now but largely unused because the plant wasn’t very vigorous. 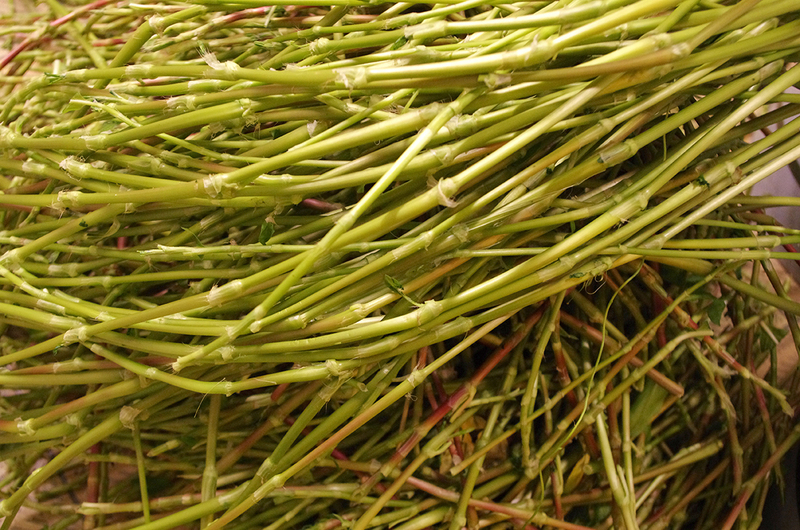 There was never enough plant material to harvest and the flowers were disappointing. This year we planted a bed of Japanese indigo alongside so the Tansy benefitted from being regularly watered. The resulting Tansy flowers have been lovely so if you’re growing them keep them watered for best results. 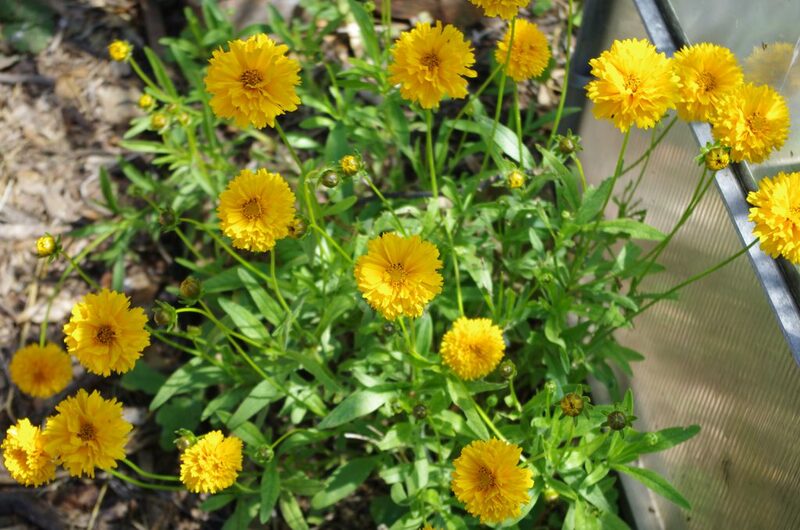 Perennial coreopsis – plant breeders benefitting the plant dyer. Bright orange on alum mordanted wool blanket. These are double flowering perennials with deep orangey yellow flowers which produce a lot of dye. They are not as hardy as the growers would have you believe as half our plants died during the winter and only a few have recovered enough to put on a good show this year. 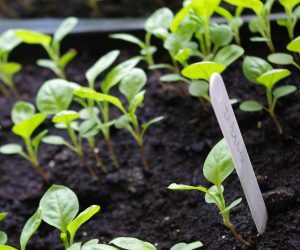 However, many can be easily grown from seed so are not too expensive to grow. 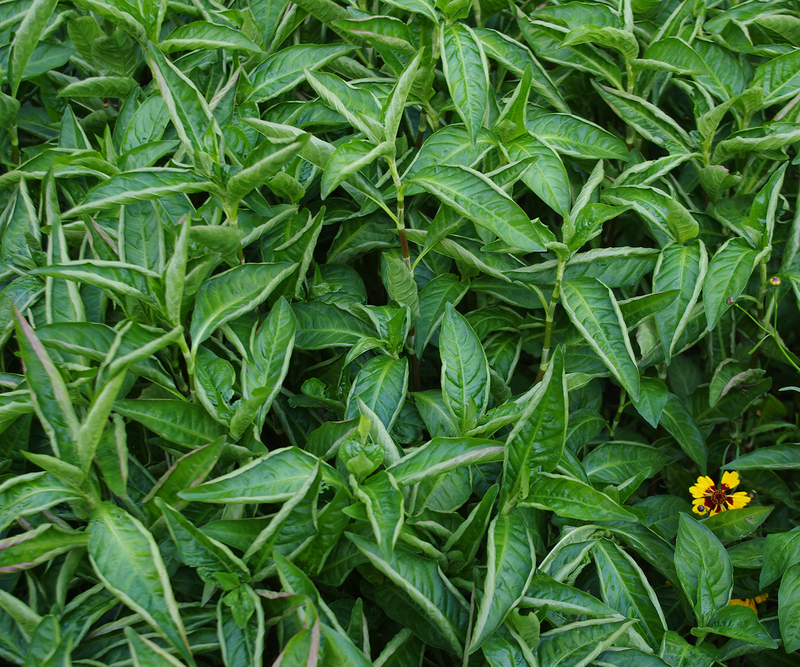 They make excellent bedding plants and produce a fabulous orange dye from the flowers. An example of the plant breeders unwittingly aiding the home dyer. Dyer’s Alkanet – Alkanna tinctoria? 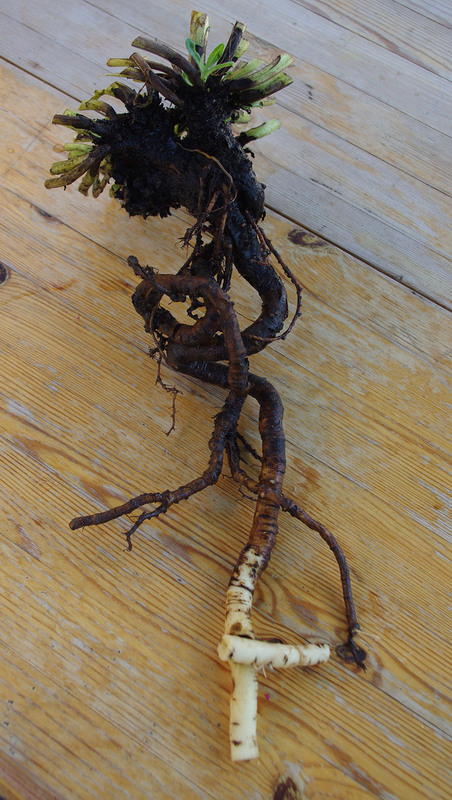 Alkanet root. Bottom tip has had thin outer black bark removed revealing the dissapointingly white root. This is the third year of growing and though I have not tried to extract any dye from its roots I am deeply disappointed to find that the roots are not red as they should be. I was suspicious as soon as I started to grow the plant from seed bought from the German Company Rühlemann’s. 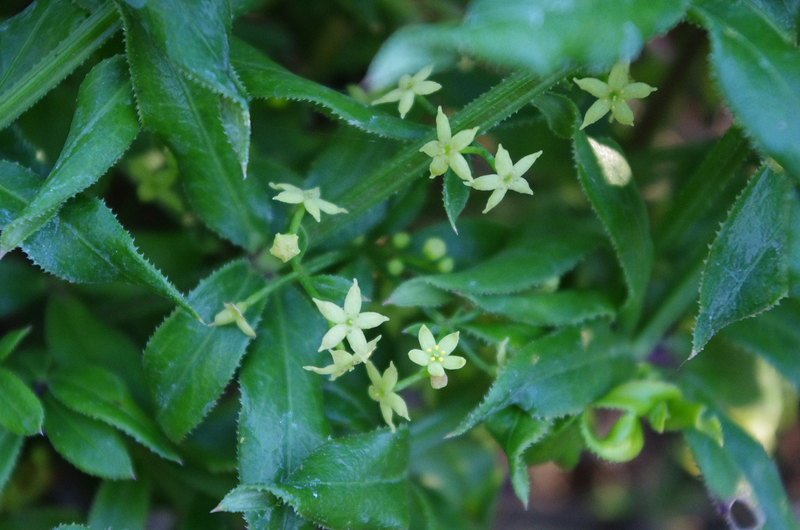 The plant seemed too vigorous with over large leaves and not hairy enough, but I persisted with it until it flowered. The flower shoots were tall (up to about a metre high) and not at all like the creeping wild flower growing around its native Mediterranean. The flowers when they finally appeared were the only part of the plant that looked like the pictures of Alkanna tinctoria seen all over the internet but the roots? The roots were white! Doing some reading around this ancient dye plant I find that its qualities as a medicinal plant derive solely from the coloured substances in the root which were used as a dye, cosmetic and bio stain so you can imagine the way I feel after lavishing attention on this plant for the last three years only to find the roots are white! 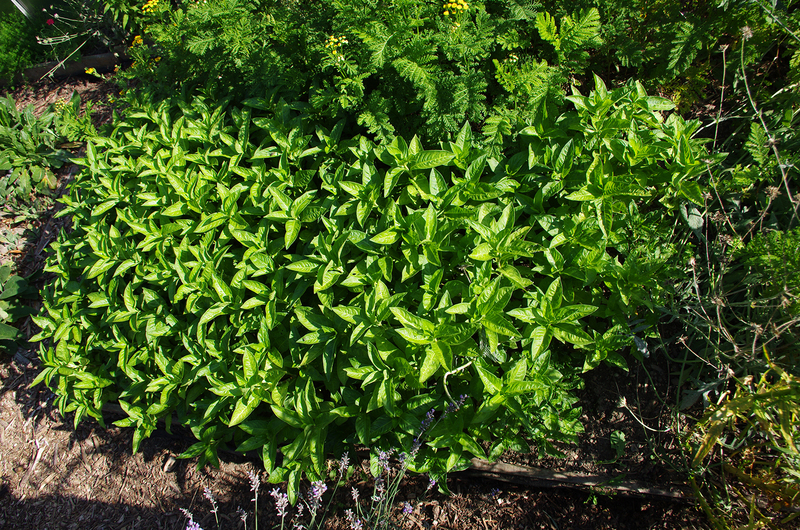 Recently I discovered one internet comment on the plant that says the cultivated version of the plant does not produce as much dye as the wild type. Well that’s some understatement. Of course it is possible that lavishing attention on the plant was entirely the wrong thing to do and I should have left it alone but it seems more likely that the growers have simply selected the seed year after year from the largest prettiest plants and in so doing have bred out the qualities that gave the plant its historical value. 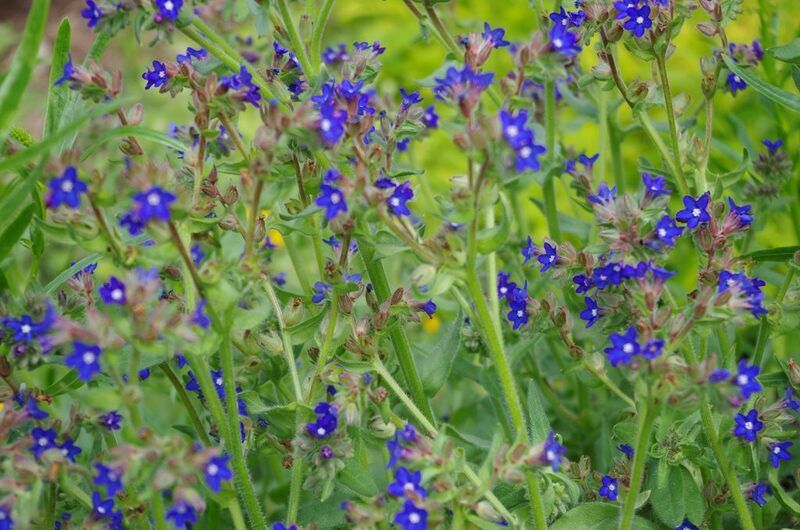 Just to confuse matters Alkanna tinctoria has been and is also known as “Anchusa bracteolata, Alkanna tuberculata, Alkanna lehmanii, Lithospermum lehmanii”, and has been given various common names as follows Alkanna Radix, Buglosse des Teinturiers, Dyer’s Bugloss, Henna, Orcanète, Orcanette, Orcanette des Teinturiers, Orchanet, Radix Anchusae. 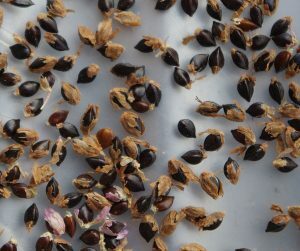 Rühlemann’s who sell the seed are now calling it Alkanna tuberculata. There is certainly confusion on the identity of all these plants. Are they all the same or not. If there are any botanists out there who can get to the bottom of this please please get in touch! Philip John and Luciana Gabriella Angelini – Indigo – Agricultural Aspects. Chapter 7 of Handbook of Natural Colorants Edited by Thomas Bechtold and Rita Mussak. Wiley Series in Renewable Resourses. (Available as free download). Rühlemann’s This German herb plant and seed supplier has a number of dye plants for sale including Chinese Woad and Long Leaf Japanese Indigo but it is primarily interested in the medical properties of the plants it sells and I get the impression they know little about plant dyeing. 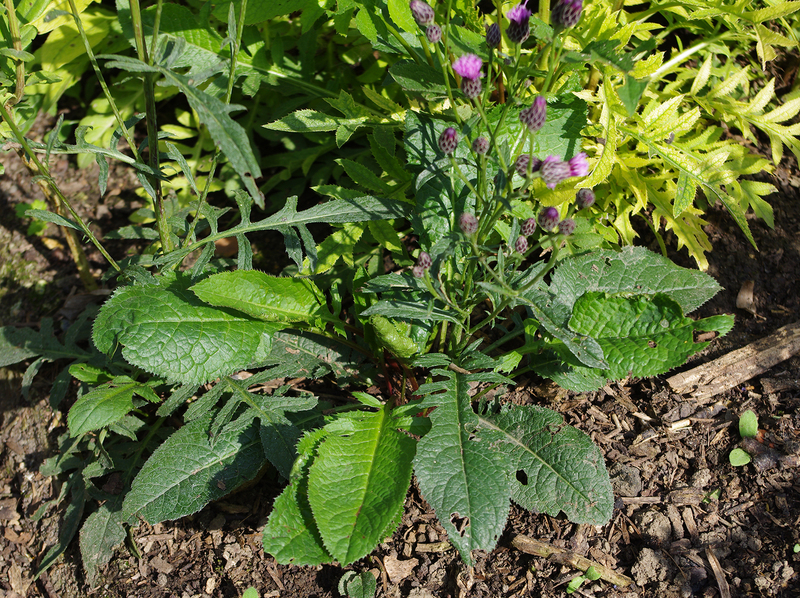 This entry was posted in Ashley's posts, Chinese Woad, Coreopsis grandiflora, Dahlia, Dyer's Alkanet, Grand teint, growing dye plants, Growing Japanese Indigo, Growing Madder, Growing Woad, japanese indigo, madder, Saw-Wort, Tansy, The Natures Rainbow Garden - 2018, Wild Madder, woad and tagged Chinese Woad, Dahlia, Growing dye plants, Indigo, Isatis tinctoria, Japanese Indigo, Madder, Natural dyeing, Persicaria tinctoria, Polygonum tinctoria, Rubia peregrina, Rubia tinctorum, Saw-Wort, Serratula tinctoria, Tansy, Wild Madder, Woad, Yellow dye on 11th August 2018 by susan dye. This year I had planned to carry out a tightly controlled experiment to look for variation in the amount of indigo produced by three fairly distinct strains of Japanese indigo. However due to a prolonged and still undiagnosed illness, my plans were thwarted and the experiment did not work out quite as I had hoped. 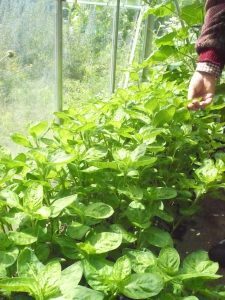 However, on 12th and 13th October 2017, with help from Brian Bond another keen plant dyer, I did manage to complete a test of the three plants although the results are not directly comparable due to different planting times and maturity of each variety. Grown from seed originally from the USA (from fellow natural dyer Pallas Hubler in Washington State on the west coast) who sent a few seeds over to Brian in 2013. We have been growing and saving seed from this strain ever since so it is possible that it has become adapted to growing in our soil. Easily damaged by high nitrogen levels in the soil. 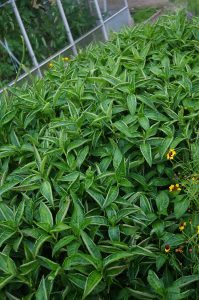 Grows poorly in cool overcast weather. Long leafed Japanese Indigo in full flower. Seed for this was obtained from the German supplier Rühlemann’s. 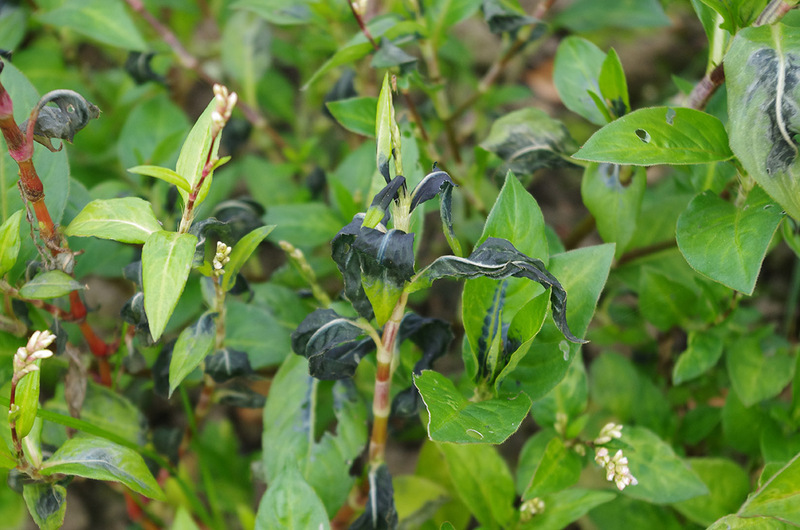 Unfortunately this was in full flower by the time I was able to harvest it for the test and from previous experiments I know that once indigo has committed itself to flower production the amount of indigo in the leaf falls dramatically. Very tolerant of high nitrogen in the soil and generally more robust. Intermediate strain of Japanese Indigo with white flower. Unfortunately this was planted out late in the year (August) so as yet I know little about its habit as there has not been enough time for it to grow to full maturity. Easily damaged by high nitrogen fertilizer. 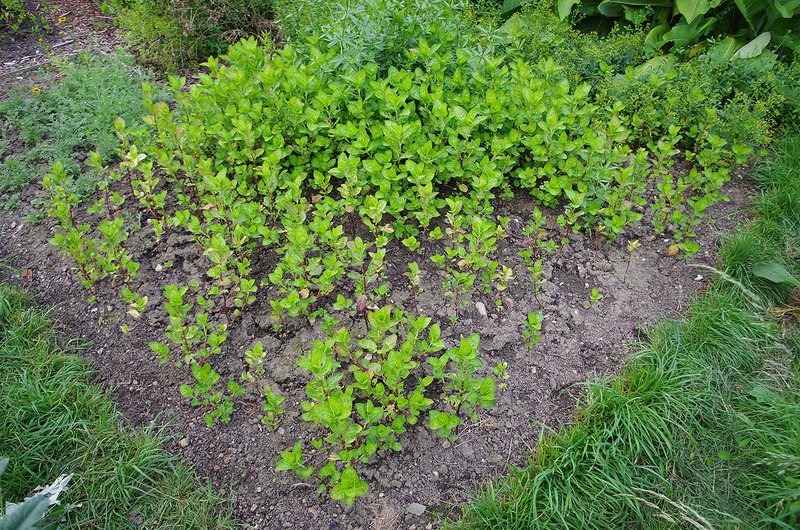 Quickly bushes out, highly branching. All three strains were grown on the Natures Rainbow allotment in Hitchin in a chalk soil with a strong application of Fish, Blood and Bone plus some chicken manure pellets. Leaves from all three strains. 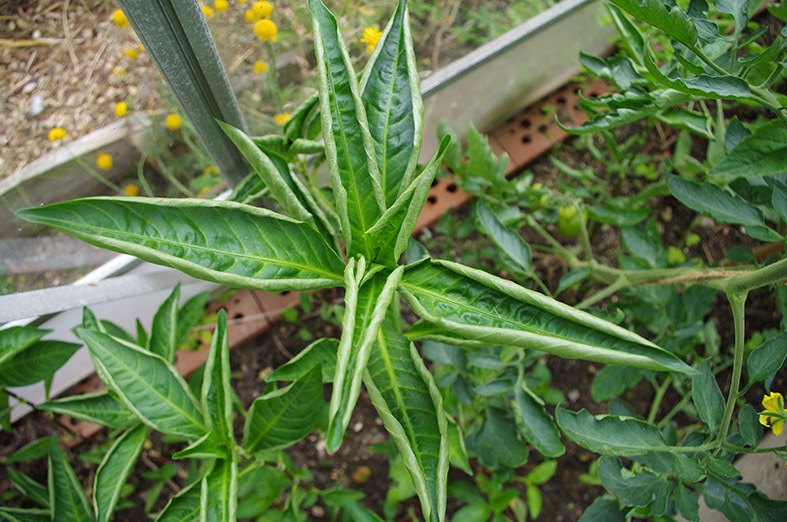 Rounded leaf Japanese Indigo growing with the Long Leaf strain in the greenhouse. Here they look like two completely different species. After stripping the leaves from the freshly cut indigo stalks, 220g of leaves from each strain were slowly heated from room temperature to 80°C in stainless steel pans with 4 litres of tap water. The pans were stirred at short intervals throughout. 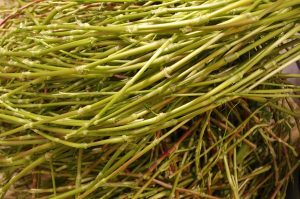 Note: the weight of leaves was determined by the amount of the long leaved strain that I could harvest from shoots that had not yet come into full flower as I wished to minimise the effect of flowering on indigo production. The amount of water in the pans was deliberately large as I wished the final colour to be on the pale side as variations in pale colours are easier to distinguish. More water also means the pot is easier to stir before the leaves are cooked. Heating to 80°C took about 35 minutes. The pans were then taken off the heat and allowed to cool, free standing in the air for 1 hour. (The air temperature was appoximately 20°C). Intermediate Japanese Indigo extraction bath with container of liquor to show gray colour. Photo taken just after pan was removed from the heat. At this point no difference could be noticed between the different pans. The liquor in each pan being a pale greyish blue in each case. After one hour the leaves were removed by straining through an old pair of tights into a large plastic bucket. Half a cup of household ammonia was then added to the liquor. Taking care not to breathe in hot fumes, this liquor was poured back and forth from bucket to pan 10 to 15 times to aerate and oxidise the indigo precursor to indigo. 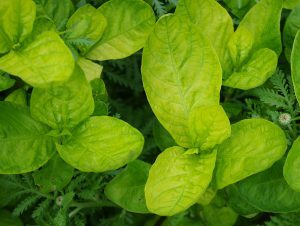 The colour of the liquor changed from grey to yellow green, with the round leaved plant giving the darkest colour change and the long leaved plant the least. This is a good indicator of how much indigo is present in each pan. Once oxidised to indigo, the liquor is now in a stable form and can be left for long periods without any loss of indigo. 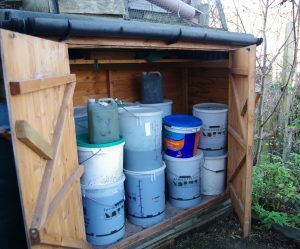 The reduction vats (indigo dye baths) were set up the following day as follows. The pans were heated to 50°C, one level teaspoon of Spectralite (Thiourea Dioxide) was added to each pan, gently stirred in and left for 30 minutes for the indigo to reduce to its soluble form. Identical weight skeins (26g) of wool were added to the baths at 50°C and left for 20 minutes before removal and oxidation in the air. The dye baths were kept in a hay box to maintain constant temperature during the dyeing. The long-leaved plants (left) were disappointing only producing an ice blue colour. 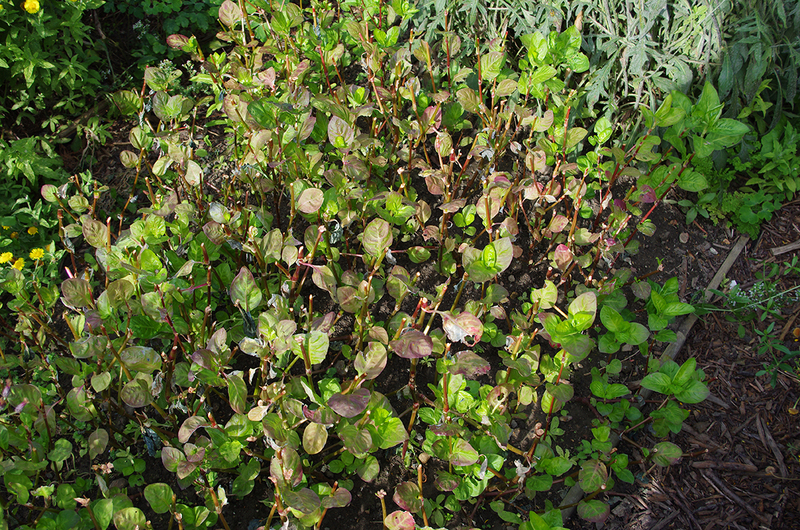 The white-flowered intermediate-leaved plant gave a slightly deeper shade but still pale (centre). 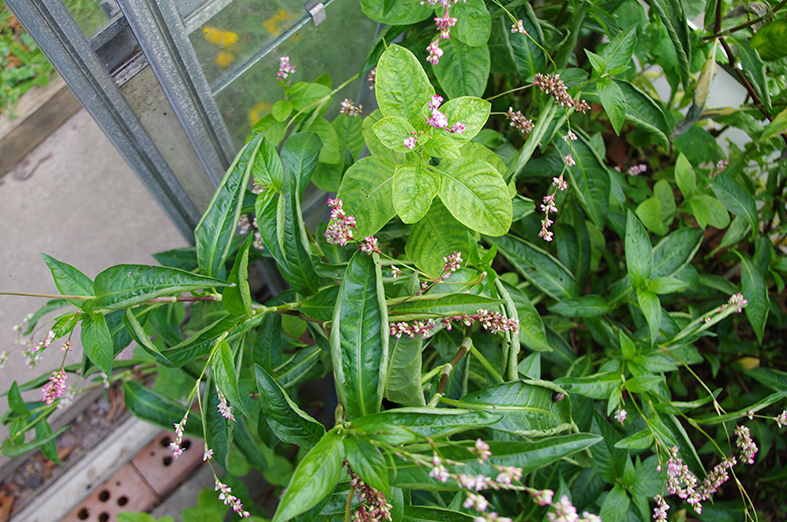 The round-leaved plant produced a respectable light blue (right). The poor results for the long-leaved plants was understandable because of their flowering state, however I was surprised the colour was quite so pale. 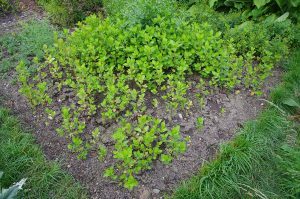 The good results for the round-leaved plant was a real surprise as I had become convinced these plants would not be the best. Overall the pale colours made me worry that I had not optimized the process and I decided to repeat the experiment for the round-leaved and intermediate-leaved white-flowered plants (I had no more of the long-leaved plant so I could not replicate this one). On the second run I made one change which was to slow the cooling of the extraction bath after reaching 80°C by placing the pans in hay boxes. For this experiment, using 4 liters of water I was aware that this small amount of liquor would cool quickly, perhaps too quickly? 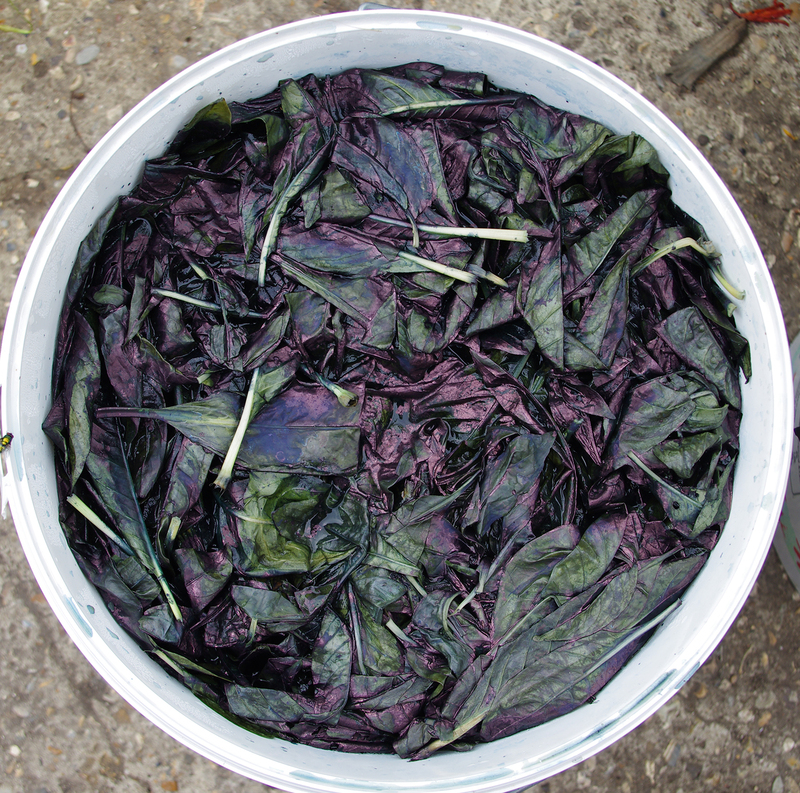 An experiment we conducted some years ago revealed that premature cooling of the extraction bath resulted in a dramatic loss of indigo when processing woad leaves. Two years ago we discovered that leaving the bath at a high temperature for more than one hour also results in a loss of indigo so I have become wary of putting large baths in hay boxes which are capable of maintaining a high temperature for hours. 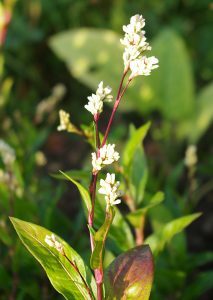 In this second run the results from the white-flowered intermediate-leaved plant improved but the round-leaved plant still produced the better result (which itself was no better than in the first run). 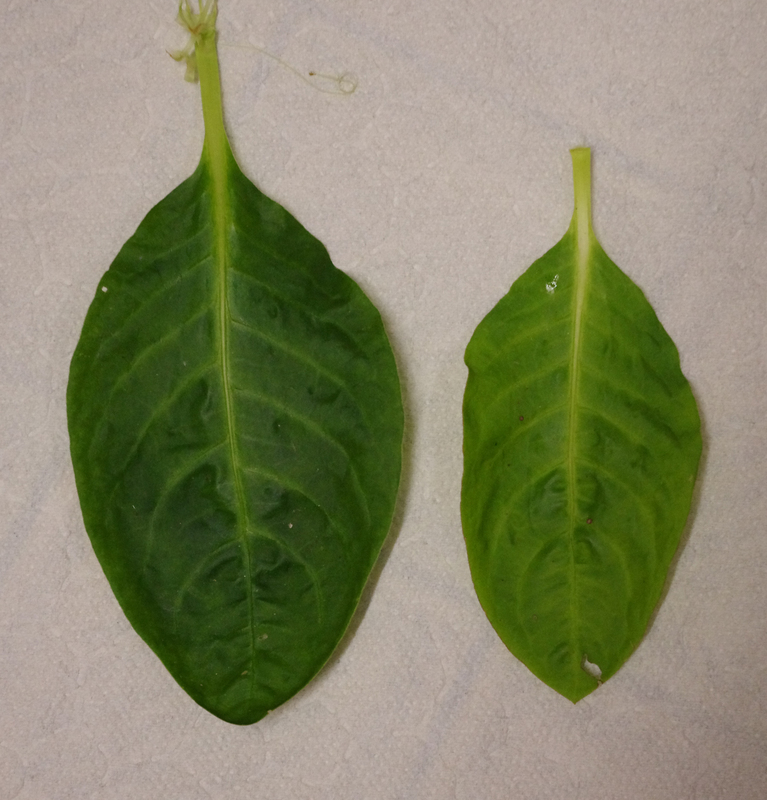 Second run with intermediate white flowered indigo plant compared to rounded leaf plant. Comparison of intermediate white flower strains. 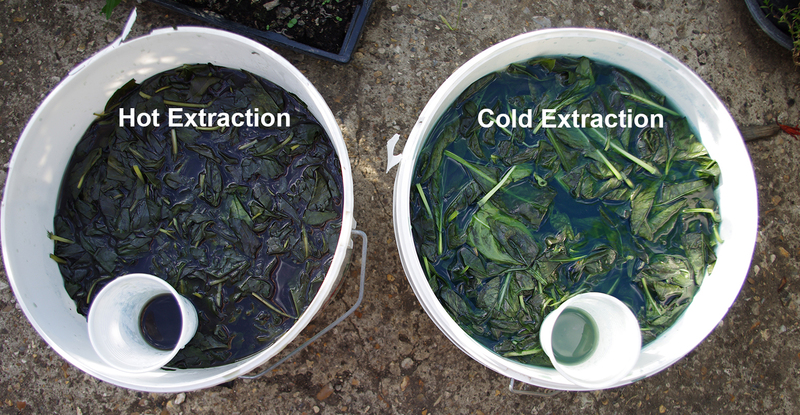 The difference between quick and slow cooling of the extraction bath. 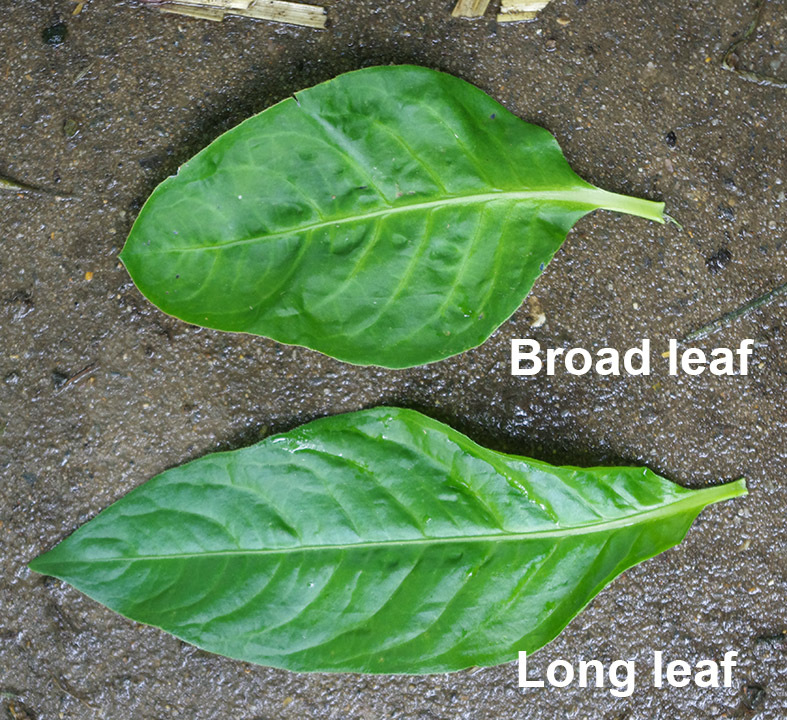 No real difference between runs for the Rounded leaf strain. In theory all three plants should have produced broadly similar amounts of indigo. That they did not could have been due to genetic differences but as noted above all three plants were at different stages of development having been planted at different times and the round-leaved strain had possibly adapted to the local soil over the 4/5 or so years I have been growing it. 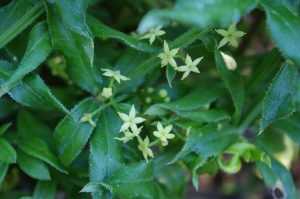 The poor results from the long-leaved plant may have been entirely due to their flowering state. 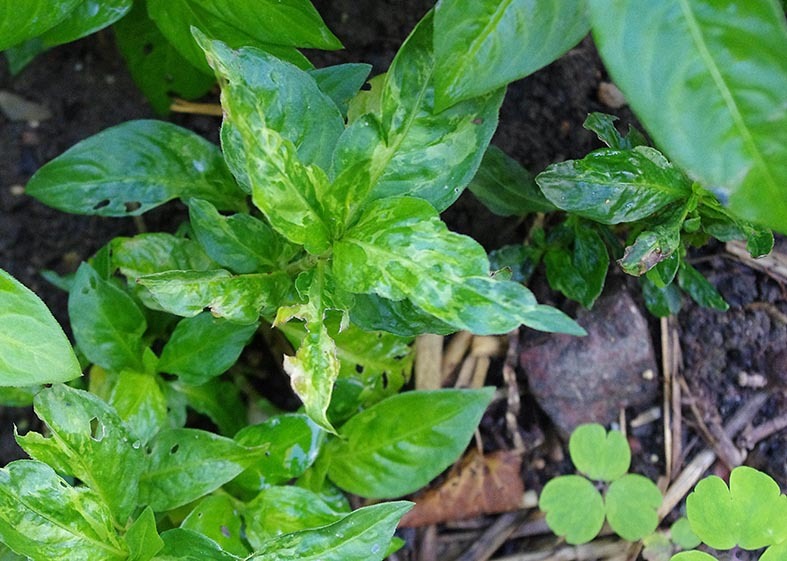 The intermediate-leaved white-flowered strain had only been planted out in late August and may not have had sufficient exposure to the sun to develop much indigo. The diversity of results shows how critical it is to grow and harvest the plant at the right time. I was certainly concerned that harvesting the plants in October was a risk, as all three varieties were producing flower buds (although only the long-leaved plants were in full flower). Later I extracted a concentrated bath of indigo by making up a large pan crammed full of leaves and only enough water to barely cover the leaves when they were pressed down forcibly. The results were pleasingly strong indicating that the leaves were still fully charged with indigo. 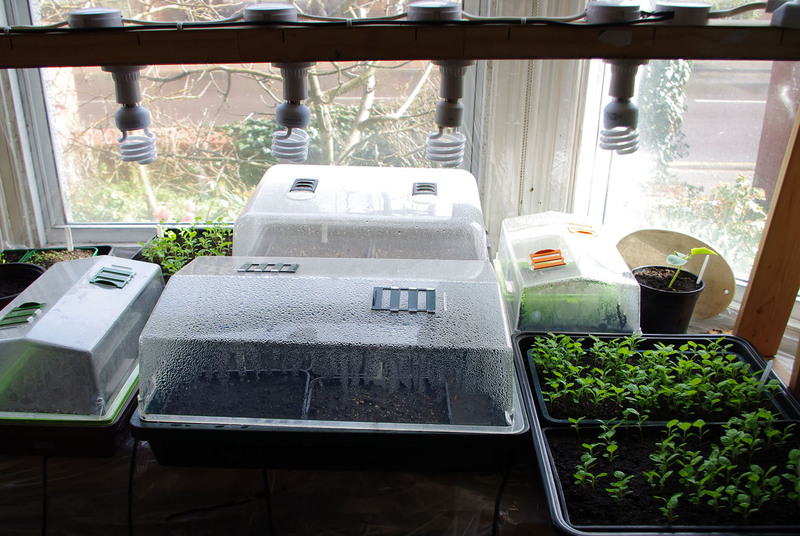 I will certainly be making strenuous efforts to continue to save the seed from the round leaf strain whatever the reasons for the underperformance of the other two strains! 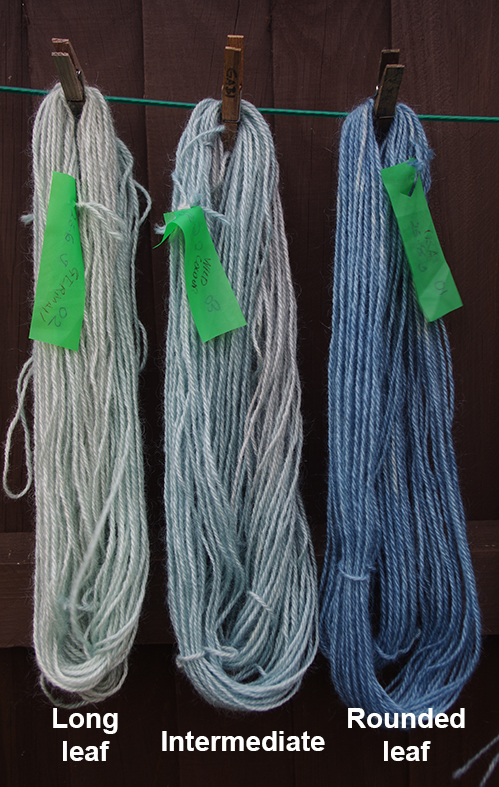 The range of blues obtained from the three strains of Japanese indigo. 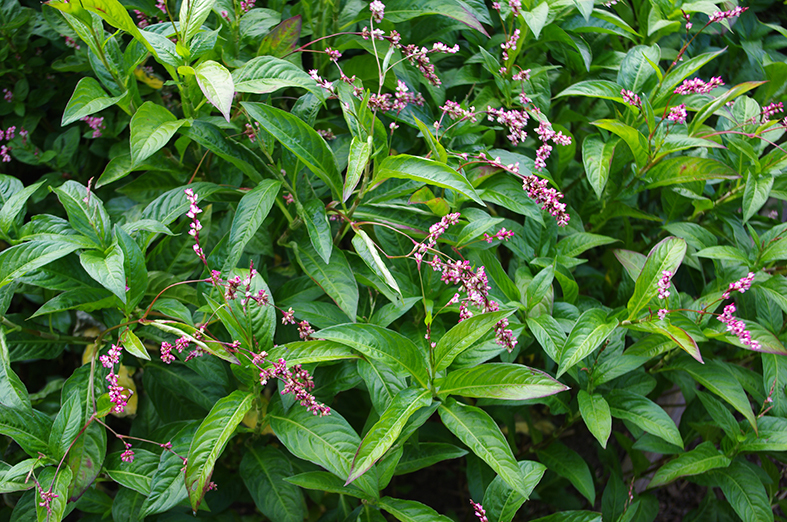 This entry was posted in Ashley's posts, Grand teint, growing dye plants, japanese indigo, learning to use dye plants and tagged Dyer's Knotweed, Grand teint, Growing dye plants, Indigo, Indigo dye, Indigo dyeing, Japanese Indigo, Natural dyeing, Persicaria tinctoria, Polygonum tinctoria on 17th October 2017 by susan dye. In June I attended a ground breaking exhibition ‘From the Earth’. 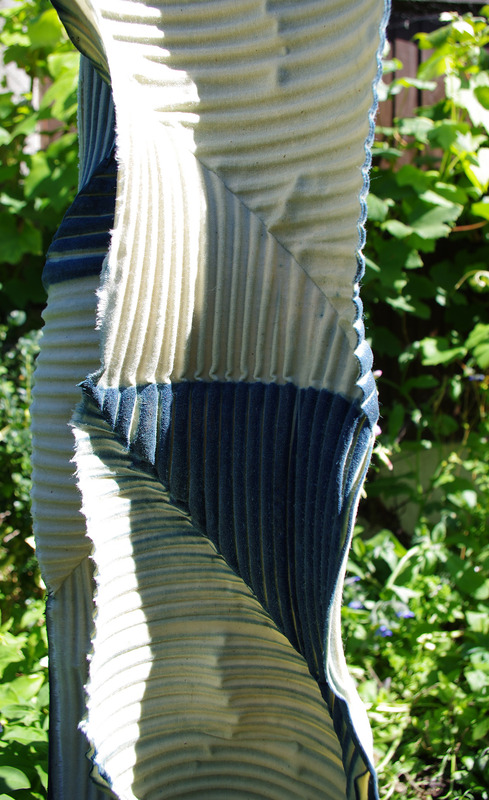 The curators Caroline Bell and Jenny Leslie wanted to enable the subtle tones of plant dyed textile art to be appreciated in a sympathetic setting. The main exhibition site was Mardelybury Gallery near Datchworth, not far from where I live in Hertfordshire. 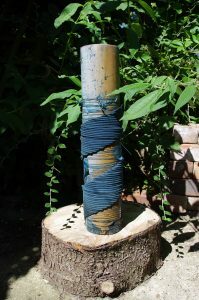 The art and craft supplier Art van Go hosted a series of linked workshops at their shop/studio workshop in Knebworth, accompanied by an exhibition of work by the tutors. 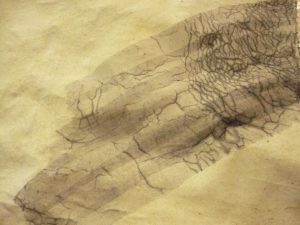 The exhibition at Mardelybury ranged from pieces by India Flint to water colours using plant pigments. But the highlight for me was attending two of the workshops: Jenny Leslie’s ‘Organic Indigo Vat’ and ‘Screen Printing with Natural Dyes’ run by Alison Hulme and Caroline Bell. Here’s a bit about the first of these two workshops. First we learned about creating crackle on cloth with a simple batter of flour and water. 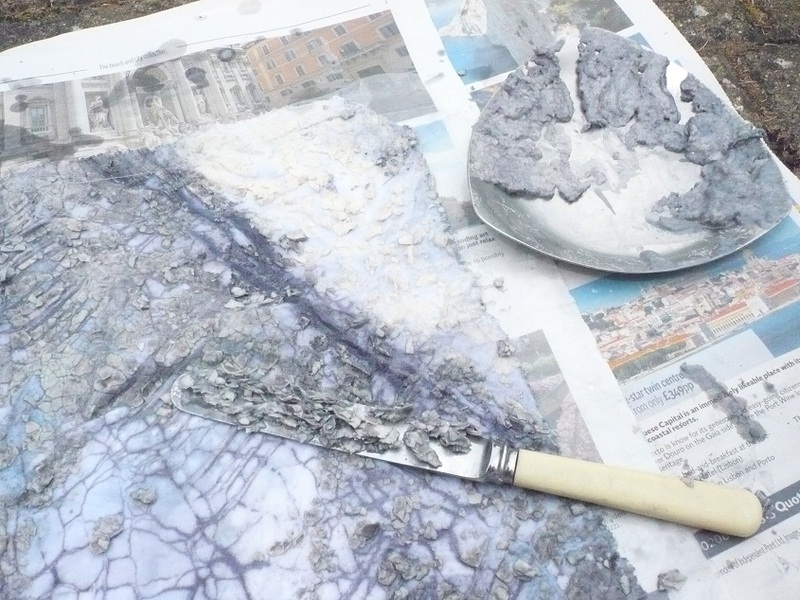 Spread with a palette knife, optionally scratch designs into the semi-dry resist, leave to dry completely and then pull the fabric from different angles to create cracks. 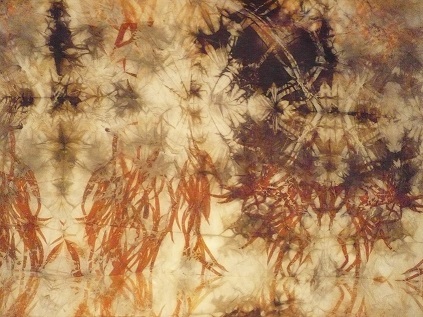 Paint iron/tannin dye ontop for a wonderful visual texture. Variations include use of porridge or other sticky starchy grains. Use mordanted cloth and overdye after removing the pastes. These are not strong enough resists to withstand a dyebath, so the iron/tannin ink is used to capture the pattern instead. Jenny also set up a fructose indigo vat for shibori resist. Seeing this ‘in the flesh’ gave me the confidence to work an indigo vat without synthetic reducing agents. Up to then part of me simply didn’t believe it could work. Inspired by the course, I collected together all of the tail ends of indigo vats we had kept from previous years (see below) plus some recent additions from William. 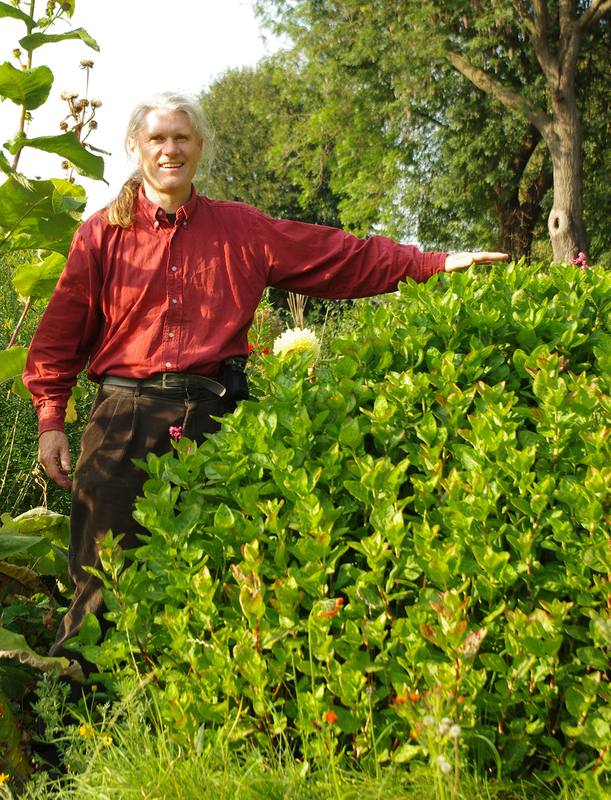 Will is a friend we taught to grow and use japanese indigo. He has amazing green fingers and produced some terrific plant dyed yarns but now he’s living on a canal boat he has other priorities. I hope to pay him back for his dye pigment in plant dyed yardage. Once there was a bike or two kept here! I love these sludges! When you grow your own indigo rather than buying it, every last speck of blue is precious. This was the dye shed much earlier in the season. 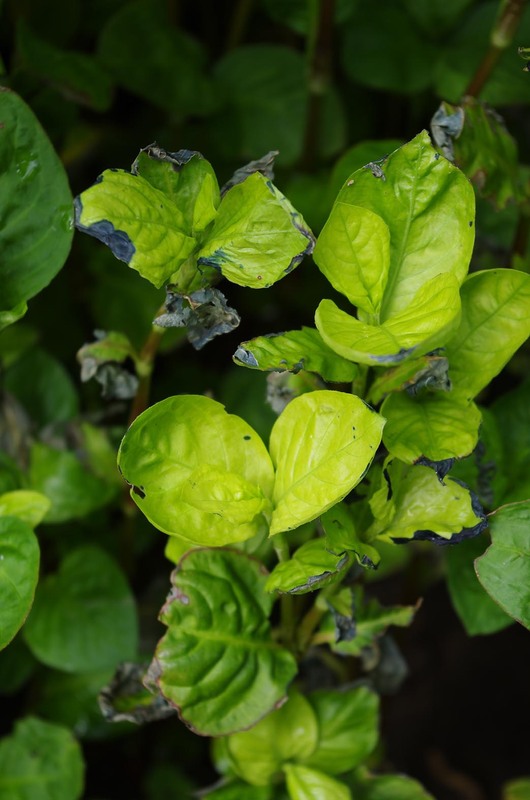 Once the indigo has been extracted from the woad or japanese indigo leaves (with alkali, heat and oxygen) the solution can be left indefinitely. The indigo particles settle over time. Carefully decant the excess water and harvest the sludge. The combined volume of the best of these sludges filled my largest steel pan. 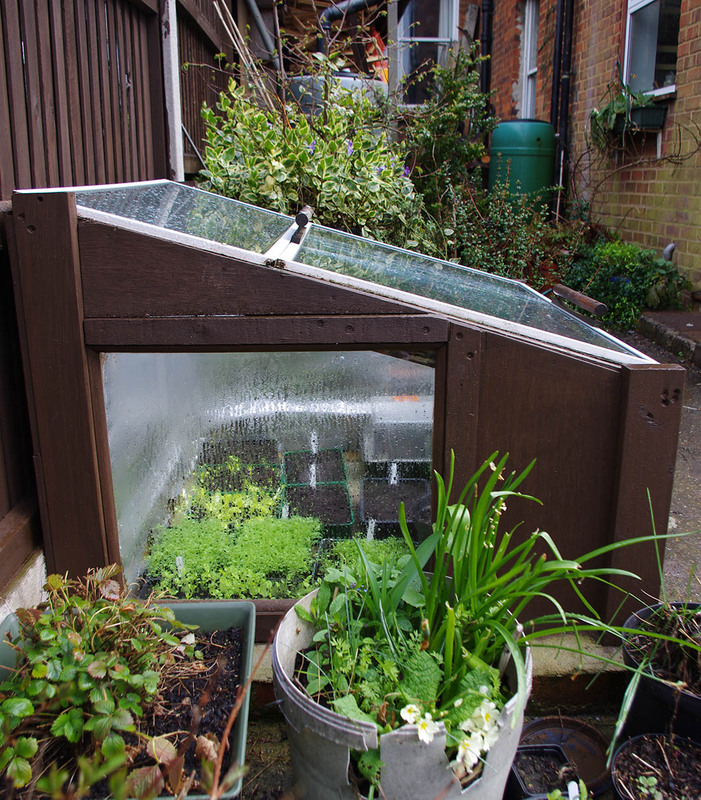 I commandeered a corner of the cold frame outside the kitchen door, added the lime and fructose (fruit sugar) and away it went. I am still learning how to condition the vat and probably added far too much sugar at one point. But it’s been giving a good colour for weeks and remains actively reducing. 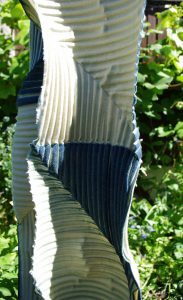 Here’s the most recent piece I have dyed with the vat: a bomaki shibori based on a method Vivien Prideaux gives in her book on Indigo Dyeing. I used a natural calico from Art van Go which has been recommended by quilt artist Bobby Britnell for its ability to drink up dye. The cloth was crispy with sugar frosting by the time it had dried out for the last time. Plastic pipe wrapped with cotton bomaki style. The fabric was probably rather thick for the number of layers of cloth involved, so the colour didn’t penetrate fully. I should have scoured the cloth beforehand, but usually it doesn’t seem to need any preparation. I’ll do another resist on the top later. Some of the inner folded sections barely took any indigo. 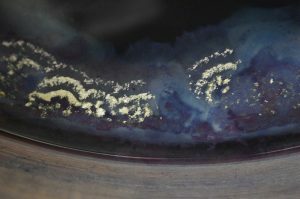 This entry was posted in inspiring teachers, japanese indigo, learning to use dye plants on 14th August 2016 by susan dye. 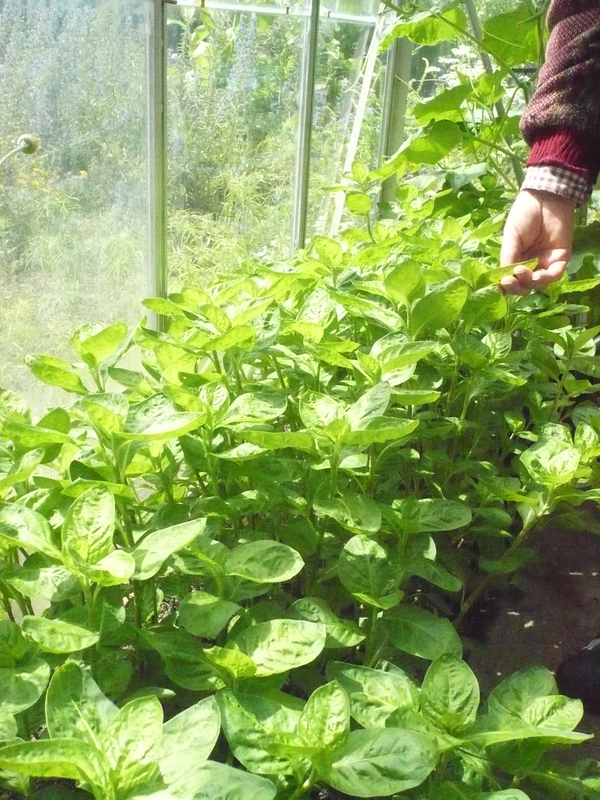 We’re expecting to have Japanese Indigo ready earlier than usual this year, with the benefit of a ‘new to us’ greenhouse on our small allotment. It’s a classic 1970s greenhouse. Very stylish! 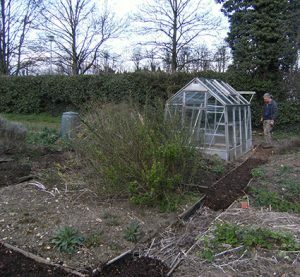 Our garden is tiny, so we rent two allotments from our local council. We grow dyeplants alongside soft fruit and vegetables on the larger plot. 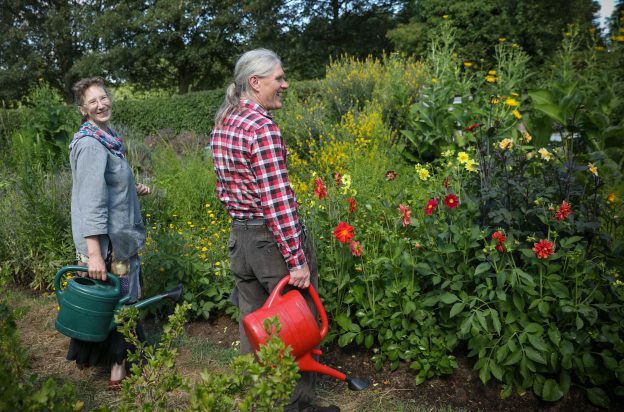 The smaller plot, nearer to the house, has herbs, the occasional brassica and masses of flowers for bees and for dyeing. We garden with wildlife in mind, only digging when absolutely necessary and avoiding chemicals. We never use pesticides but we do use ‘wildlife friendly’ pellets to protect tender seedlings from slugs and snails. 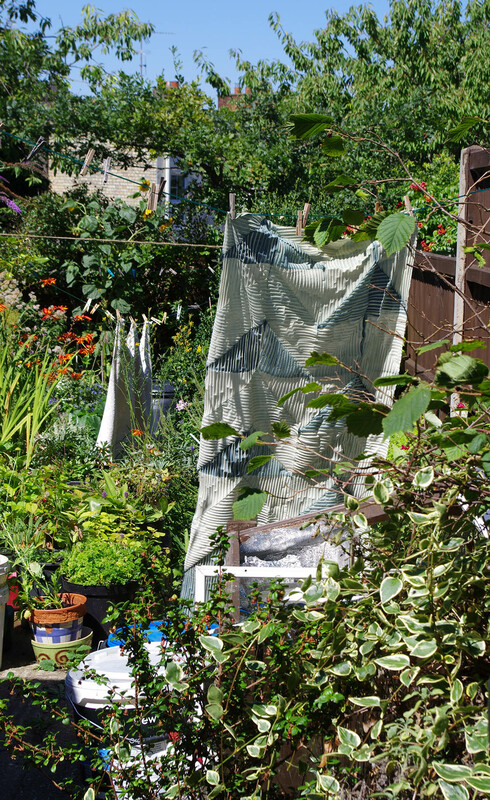 Both allotments have wild corners and compost heaps, home to many over-wintering frogs and toads. The earthworm count in the soil is always pretty high. We found a slow-worm hibernating in the little allotment compost heap a few years ago and haven’t turned or moved the heap since! This entry was posted in growing dye plants, japanese indigo on 30th March 2016 by susan dye.